This page last updated: 14 April 2019. Stuart Mackay of www.railcar.co.uk helped me with additional pictures and Chris Moxon of preserved.railcar.co.uk put me in contact with Alan Pitt of the Great Central Railway near Nottingham where Dave Watts, the co-owner of a class 116 DMU (one of only two that remain) very kindly allowed me to take detailed pictures and measurements. Having never done this before lord knows how it is going go turn out. 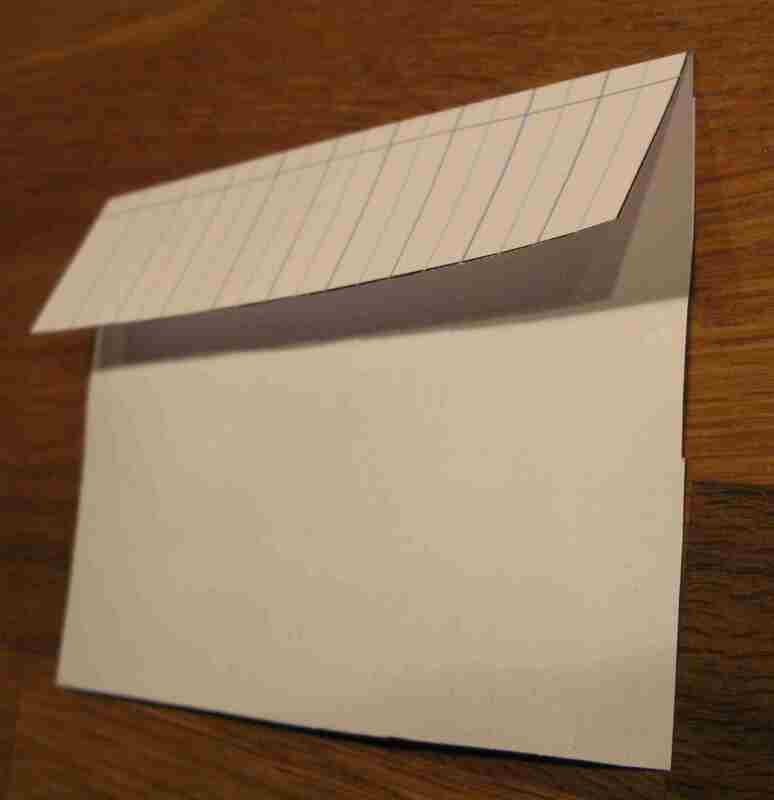 But I have to start somewhere. 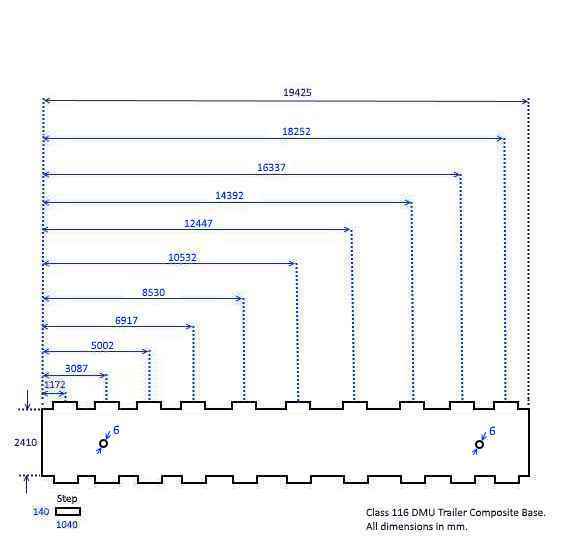 It is worth pointing out that the project is portrayed below in a linear fashion for ease of reading but was, of course, the usual tangle of iterations and frustrations. 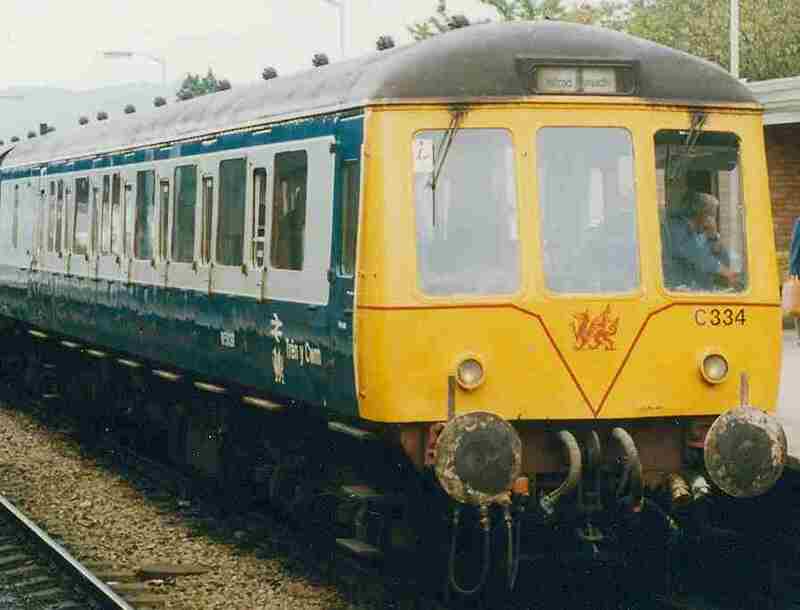 Oh, and I didn't build a trailer composite car since my littul railway is so small that there was a danger the DMU might meet itself leaving if I did that. All the Blender/CNC files created during this project can be downloaded from Github. Note that I've chosen to use 1/32 scale to keep things simple, rather than the exact 30.48 factor implied by 10 mm to the foot. 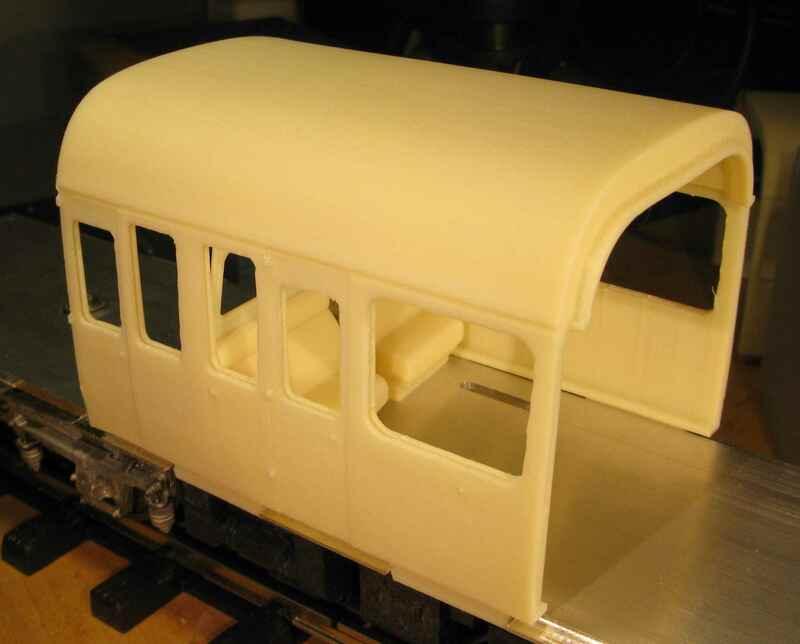 The dimensions of the vehicle are based on the drawings from www.railcar.co.uk enhanced by a visit to the Great Central Railway for a detailed photographing/measuring session. One point of detail to note, which I got wrong first time around: the hinges of a door are always on the left as you face the door, hence the doors on either side open different ways with respect to the direction of travel of the DMU. 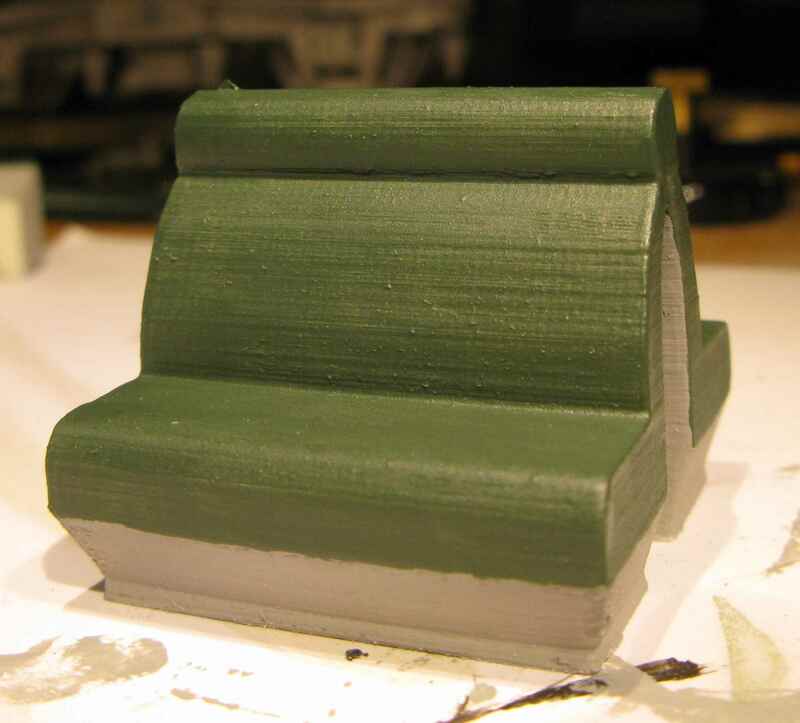 I spent a month or so designing the 3D printed cabin. It took some considerable time to get my workflow correct in Blender, the de-facto free 3D design package (primarily intended for animation); it is arcane and complex but there is a lot of community help out there which makes it ultimately useable. Since Blender is intended for animation it is not so good at maintaining a "manifold" object, i.e. 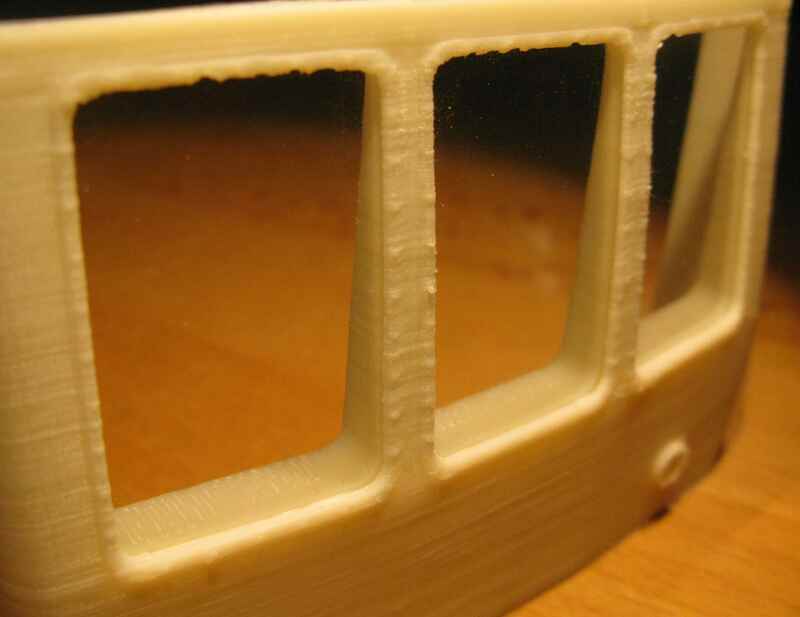 one which 3D printing software can understand and print; a real closed shape, without one or two-dimensional protuberances, which can very easily appear when creating complex meshes. Anyway, here is the finished article and the final print from my Prusa 3D printer, along with many of the test prints, all printed in PLA, the default material for 3D printing work (which is long-term biodegradable). 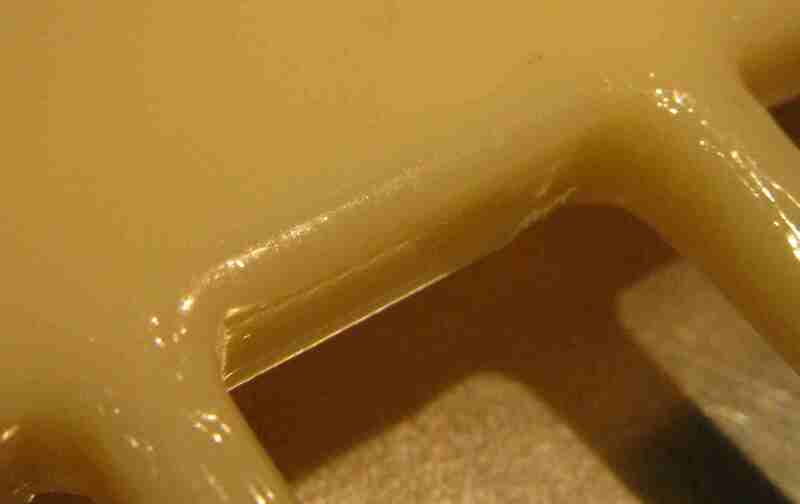 The "optimal" resolution (balancing print time and quality) of my printer is only 0.15 mm and you can see this very clearly in the rivets, probably the part of the model which took longest to get right. 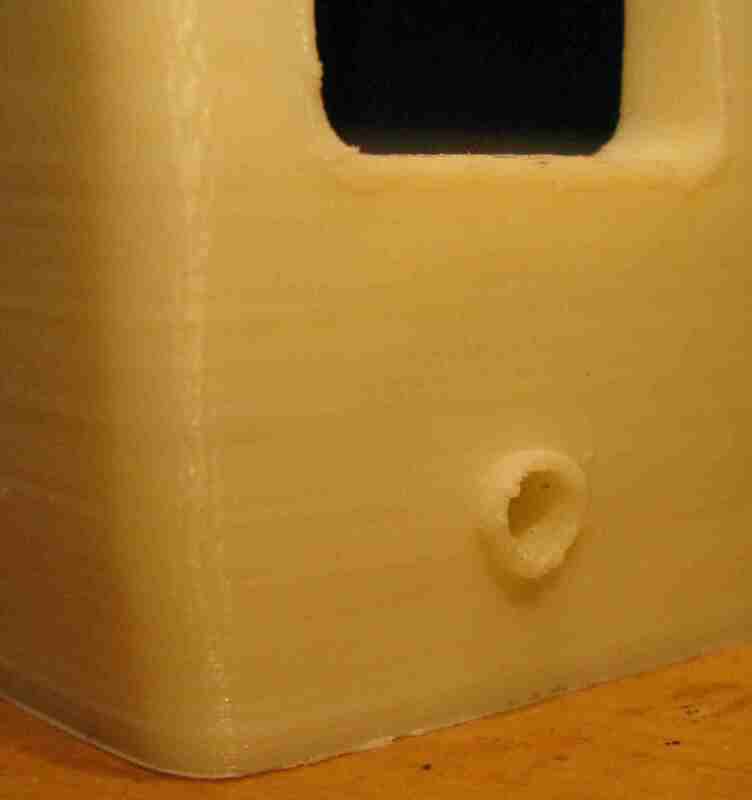 0.10 mm layer height seems a sensible compromise. And I need to align those edges along the x-axis to avoid the rastering effect. 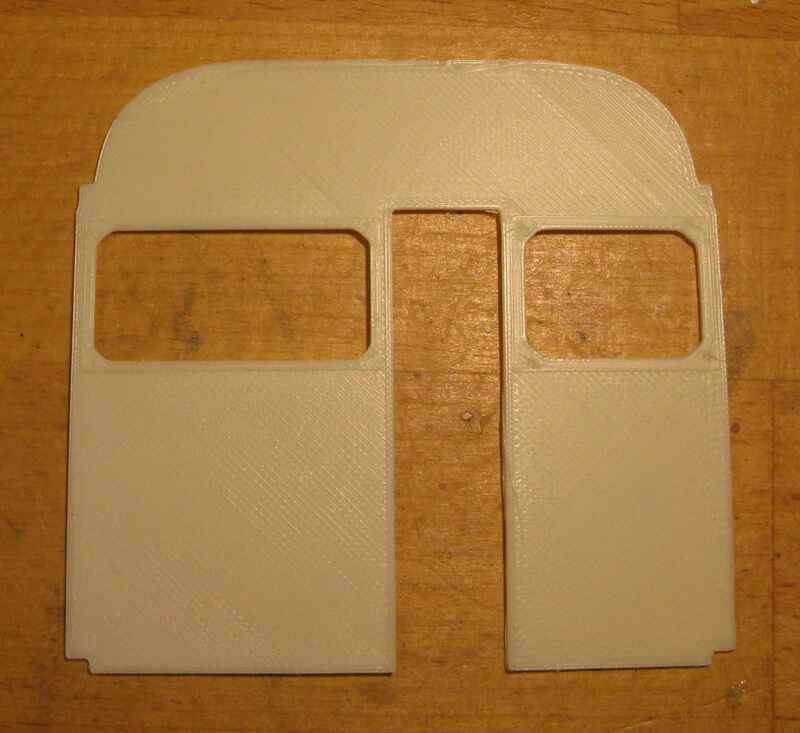 on the right is the same printed on my Prusa MK2S printer at 0.10 mm resolution (in ASA), for comparison. Having satisfied myself that this was the right approach, I started adding detail. 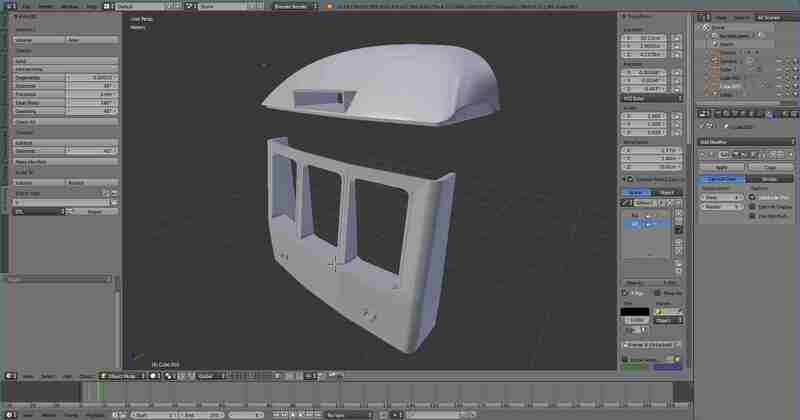 First, I added a slot to the Blender model of the cabin into which I could insert windows (cut from the 0.5 mm plastic sheet used for dolls house windows); these windows aren't going to be pushed out by mistake when handling the model. They would have to be masked if I were painting post-assembly but I think I will be able to paint the individual sections before assembly and only then insert the windows. 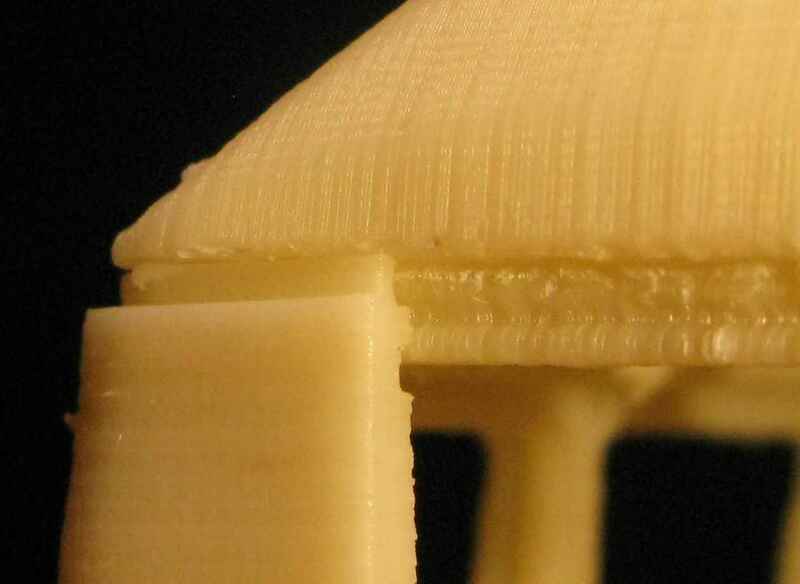 ..and finally, since such an intricate object tends to cause the slicing program to add random support structures which become difficult to break away, I manually added just the supports I needed and spent 18 hours printing out the final ASA object in 0.05 mm resolution. 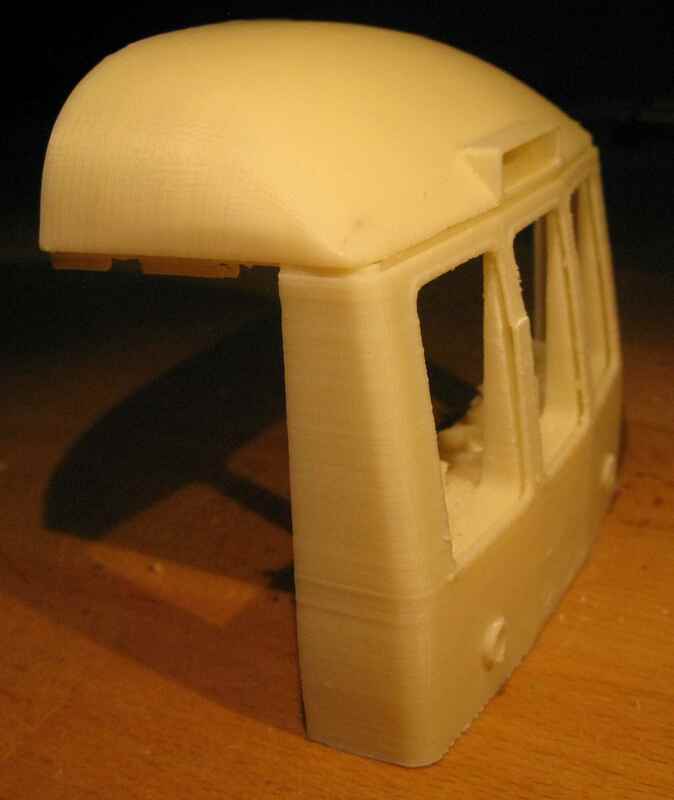 Here it is, on the left just as printing completed and on the right the assembled article awaiting painting; the gap between the roof and the cab front is for a guttering strip which will be added later. I purchased from Tenmille a pair of AG140W bogie kits and from Fosworks a pair of MOT100 nose-hung Fosmotors, powered from 12 V on 30 mm diameter wheels, plus six plain-old MOT310 30 mm diameter wheels; I tried 34 mm wheels originally but the aspect ratio of the whole thing looked wrong and the buffers to adjacent cars ended up being a few millimetres too high. 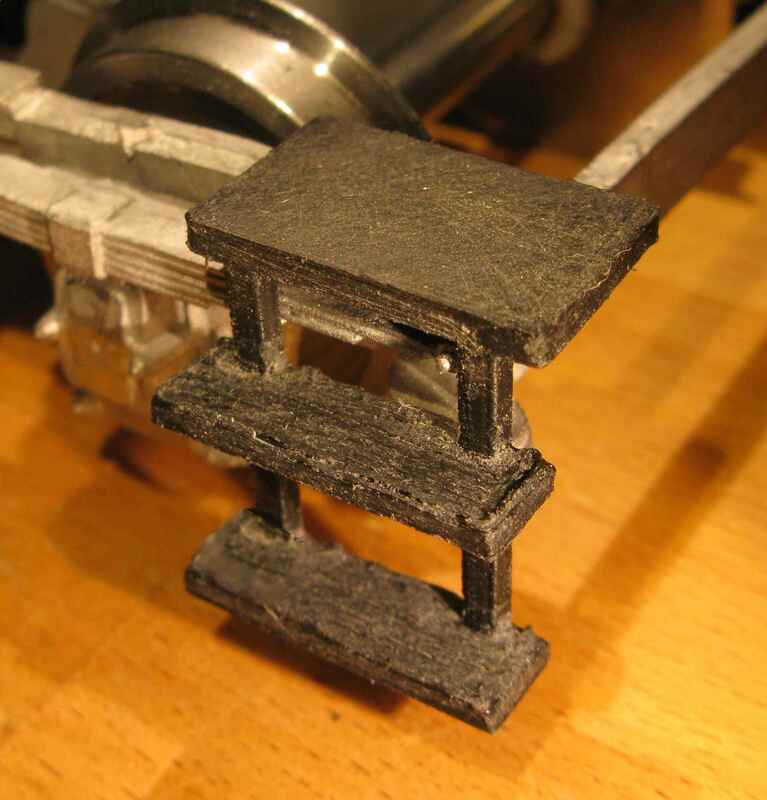 Assembling the bogie with the un-driven wheels was fairly straightforward. 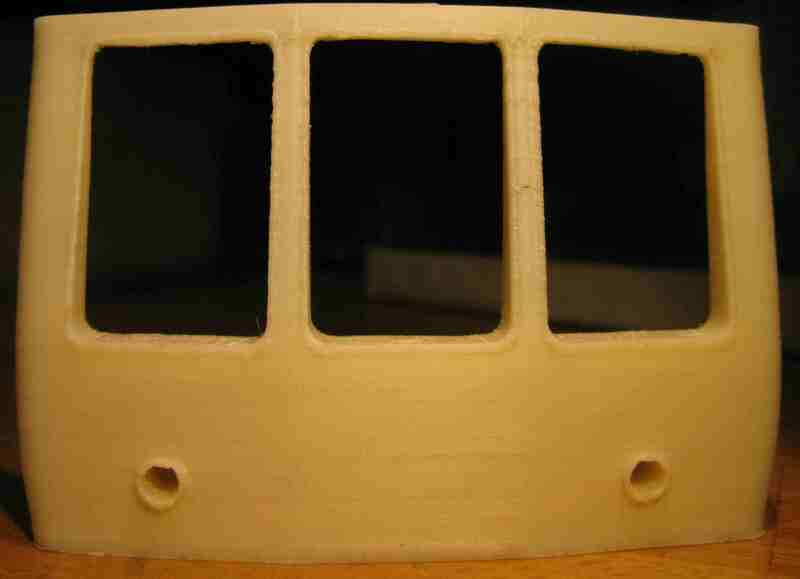 I filed off the "SR" emblem from the axle covers of the casting and left out the optional step across the middle (which is only required for brake vans). 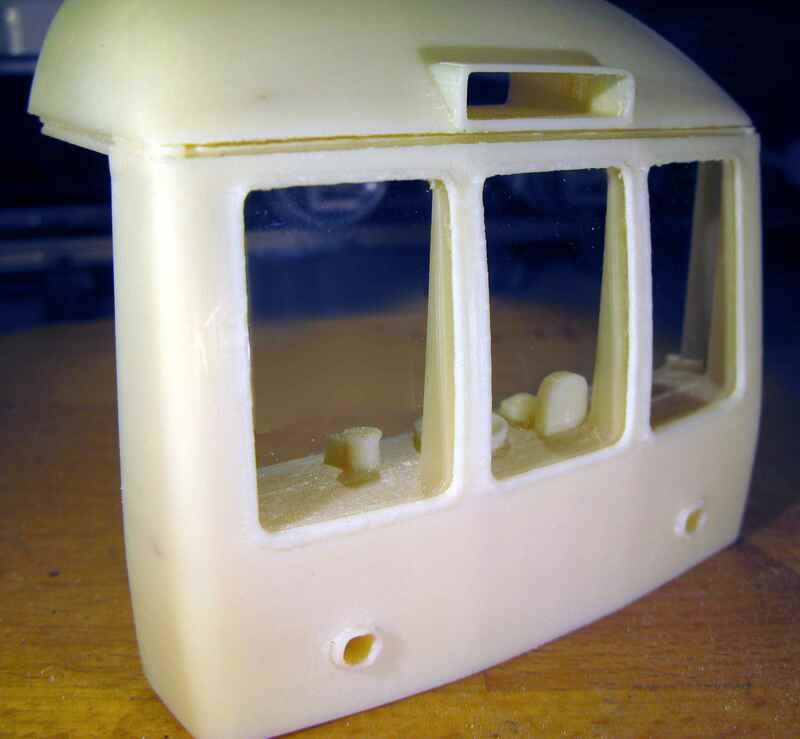 To fit the Fosmotors in the other bogie, I first drilled the 2.25 mm holes as directed in the bogie assembly instructions (2.3 mm is fine) then test-assembled the lot without glueing anything but with everything held together as tightly as the final thing will be. 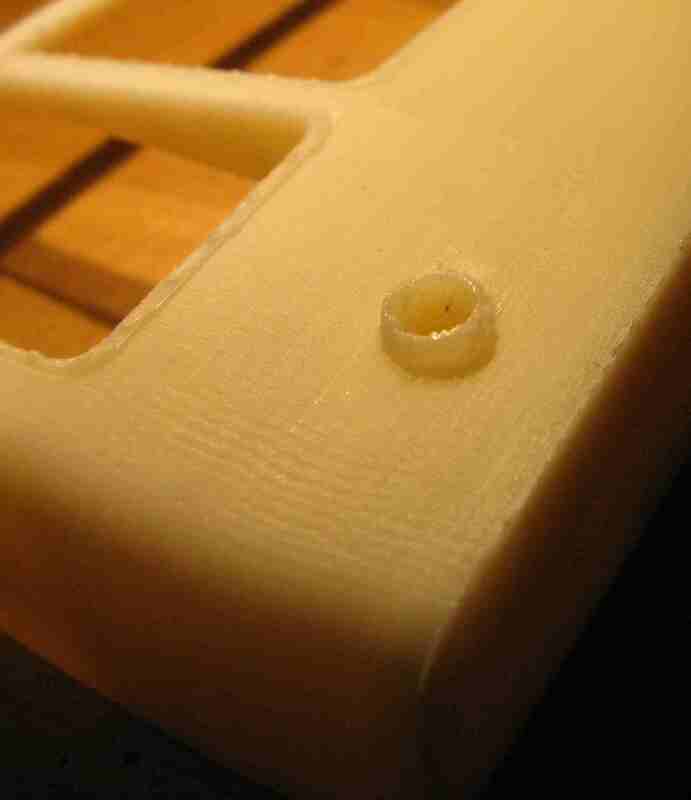 I checked that the wheels ran freely; if not, the 3.2 mm holes in the side-plates may need to be drilled slightly deeper. 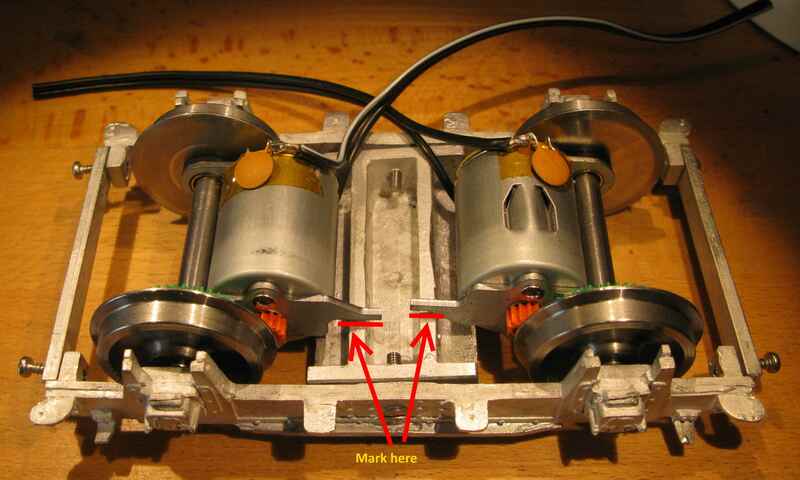 With the wheels visually centred between the side-plates, I marked on the bogie centrepiece where the Fosmotor suspension brackets landed. I disassembled everything and glued the nylon axle bearings into the holes with cyanoacrylate adhesive; I was sparing with the cyanoacrylate adhesive, didn't want it collecting in the hole. 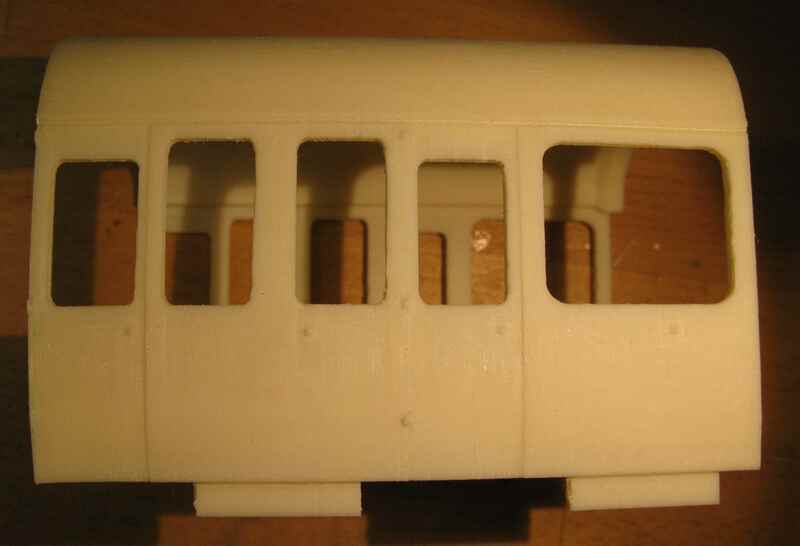 I drilled 6 mm holes in either side of the bogie centrepiece where the marks were made, drilling the 6 mm hole in the centre/top at the same time, and again test assembled the lot, easing the Fosmotor suspension brackets into the holes and making sure that the wires come out over the top of the bogie. 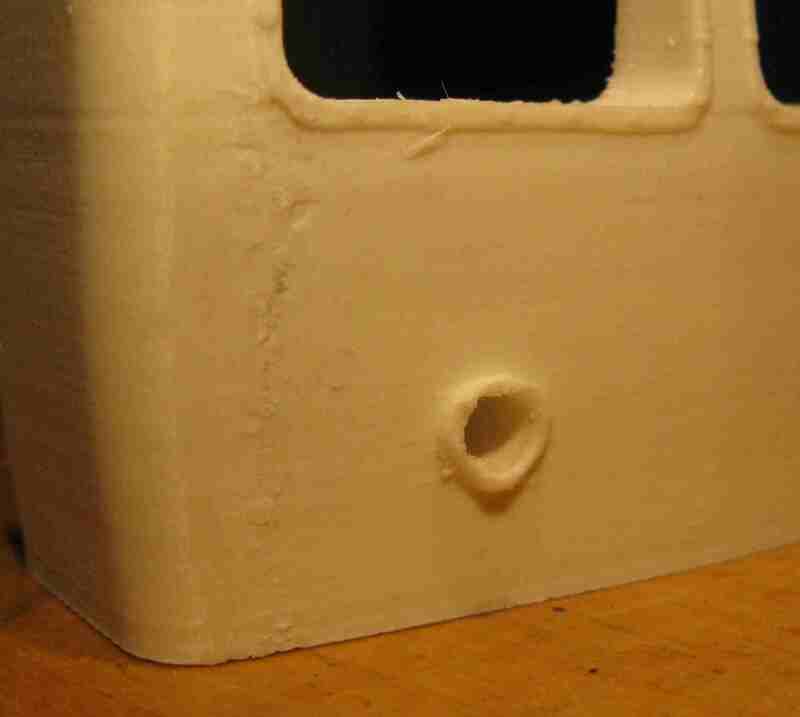 I did this a few times, using a needle file to ease-out one of the holes in the bogie centrepiece sides in order to get everything to assemble nice and square; you can see the shape one of the holes ended up for me in the picture below. 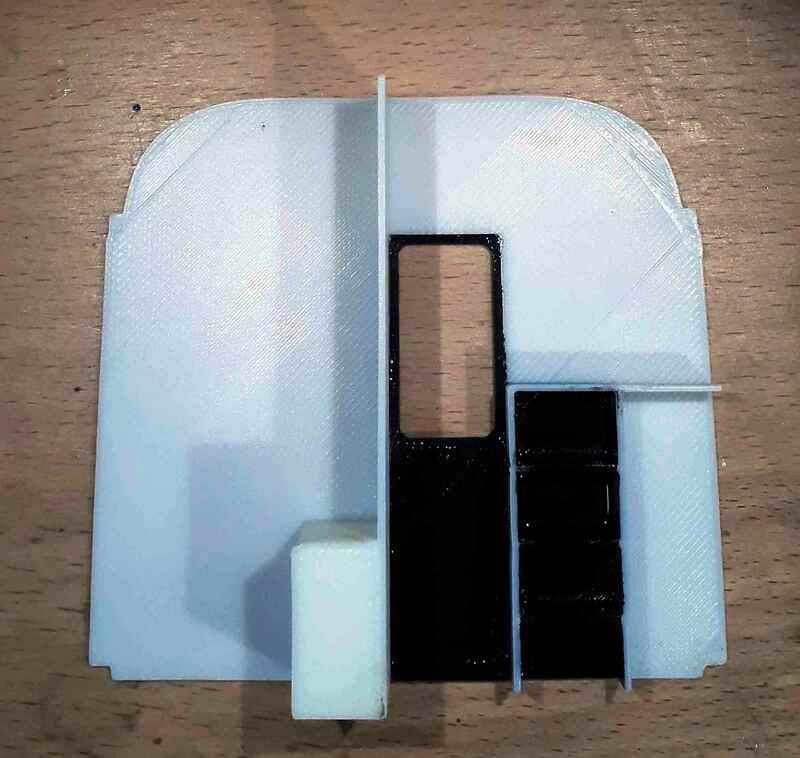 I originally tried making the steps up to the cab with folded aluminium (you'll see these in some of the videos below) but they stuck out too much so instead I printed them in black ASA. 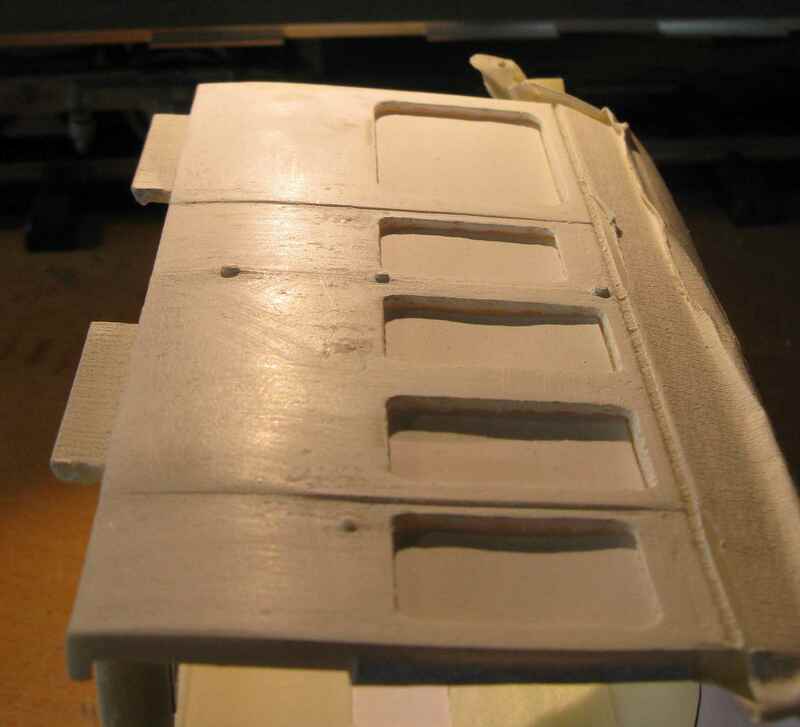 The steps were adjusted as necessary with a sharp knife, ensuring that the portion which hooked-over inside the bogie did not foul the wheels, and glued into place with cyanoacrylate adhesive. 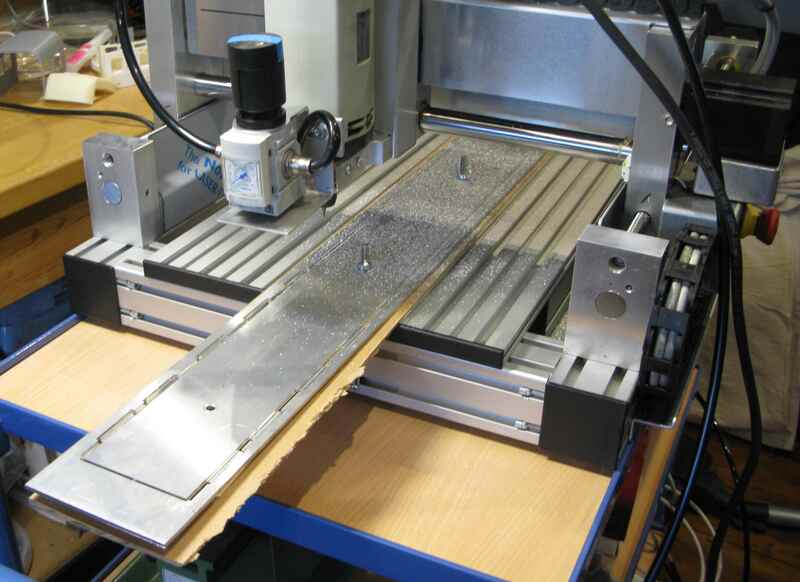 I decided to CNC cut the base of the chassis on my High-Z/S-400T CNC milling machine from cnc-step.de. I began by making a few drawings, including castellations that represent the wooden steps up to the doors. Note: the bogie attachment holes are 6 mm and are drilled beforehand in a stand drill so that I could then use the same holes to bolt the plate to the milling machine while it is being cut (and in fact I had to make an additional 6 mm hole in the centre of the plate for that purpose as well, which came in handy later for electrical wiring). I added two slots to accommodate Velcro straps that will hold the battery in place within the chassis of the motor open second. 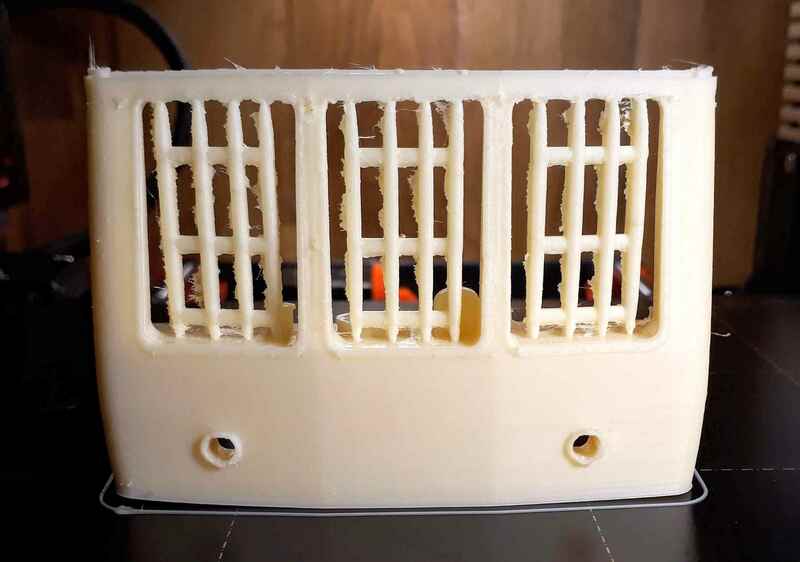 Here's a preview of the motor open second base, drawn in VCarve, the software which happens to come with my milling machine, and the resulting work for the motor open second portion of the DMU. 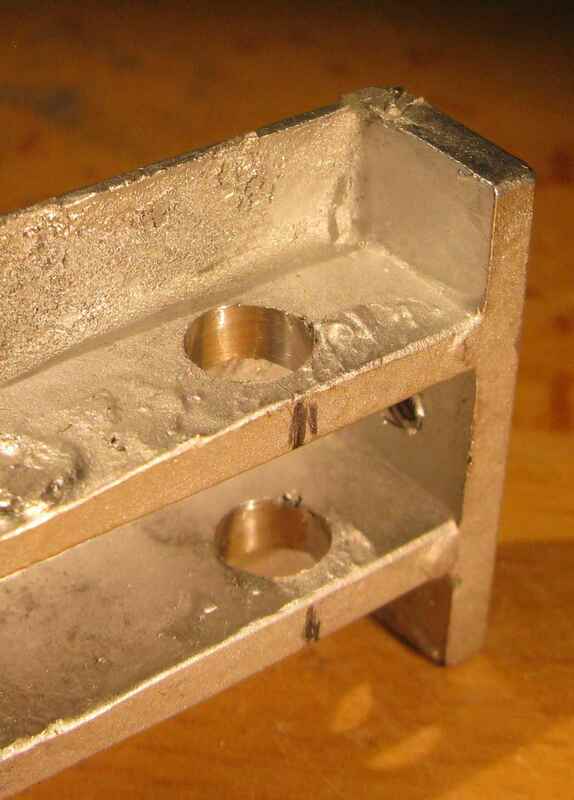 I cut the first version in SWG 10 brass plate (3.2 mm thick, which just about scale-matches the 110 mm depth of the upper part of the visible chassis frame), thinking that I could then braze a length of brass bar to each end to which I could attach buffers etc. However, this was way too heavy (over 1 kg) so I re-cut it in the 3 mm thick aluminium plate you see above (weighing less than 400 gm) and will attach a bar to the end by some other means. 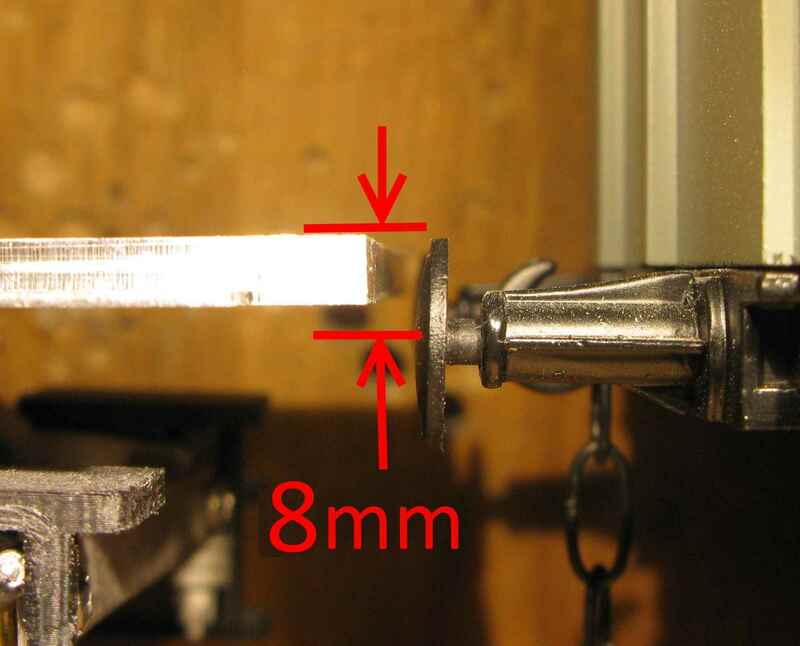 The spindle was run at 14000 RPM and I used 2 mm and 4 mm Only One PM60 end-mills from Cutwel. 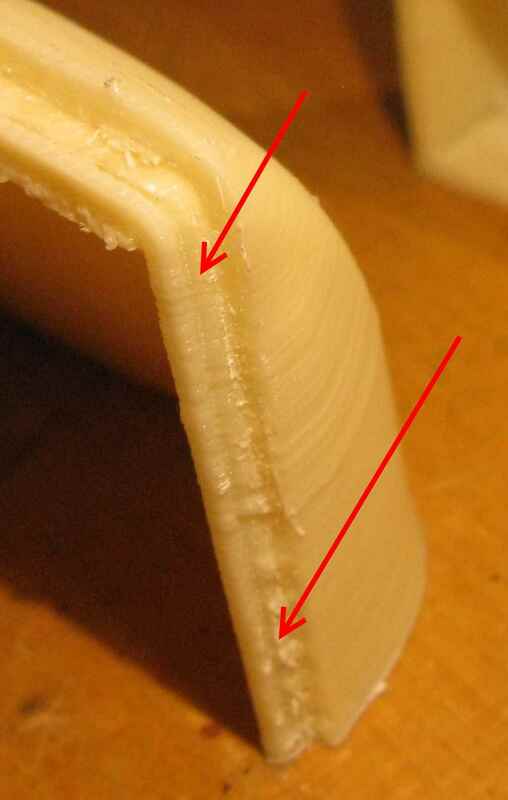 A sacrificial strip of 3 mm MDF was placed underneath the job so that the tools could cut through. 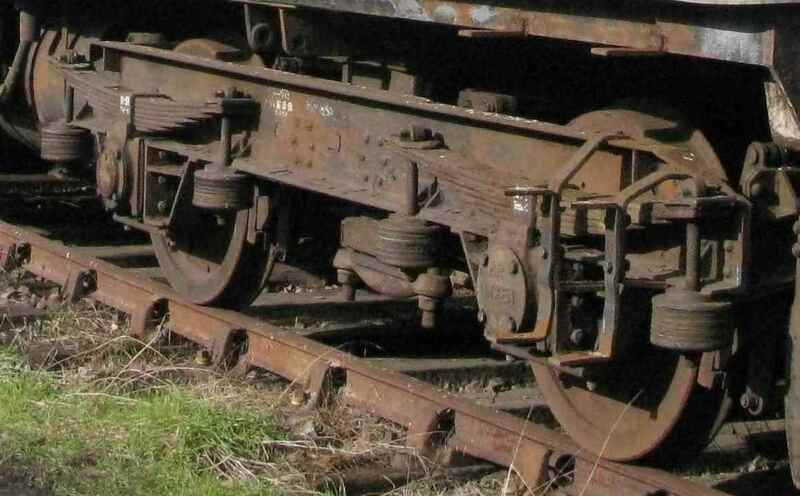 The bogies were mounted on the chassis using 40 mm long M6 cheese-head hex bolts. 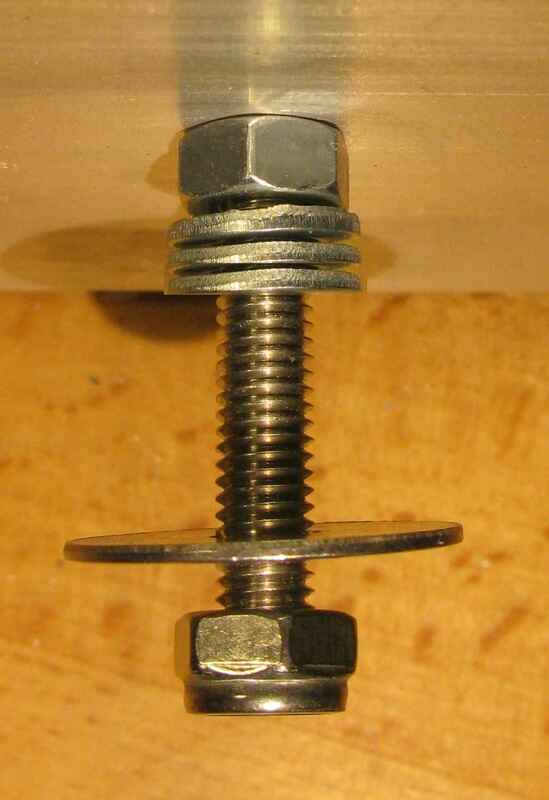 I used one nut (5 mm high) and a washer then the bogie itself followed by a nice large washer and a lock-nut. 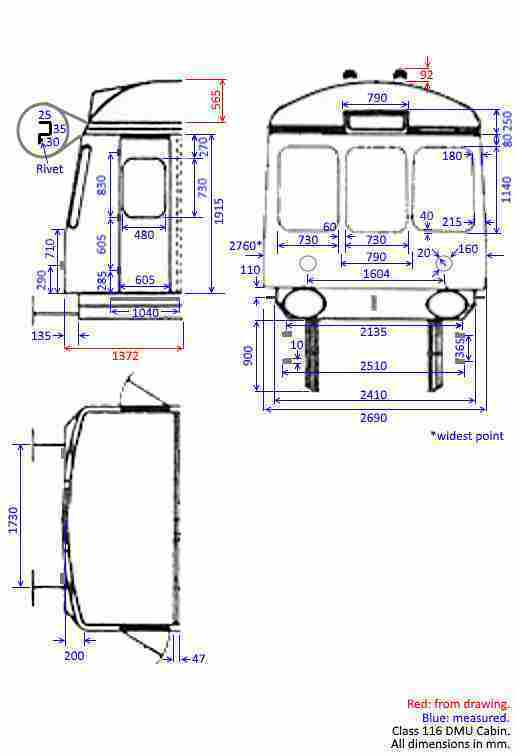 The drawings suggest that the buffer centre should be 180ish mm below the top of the chassis plate, 6 mm when scaled, leaving 7 mm clearance between the tops of the wheels and the chassis base. However after creating the buffer bars and lining up the buffers with those of another Gauge 1 vehicle I found that 7 mm was the right choice and so added another washer, leading to the clearances shown below. 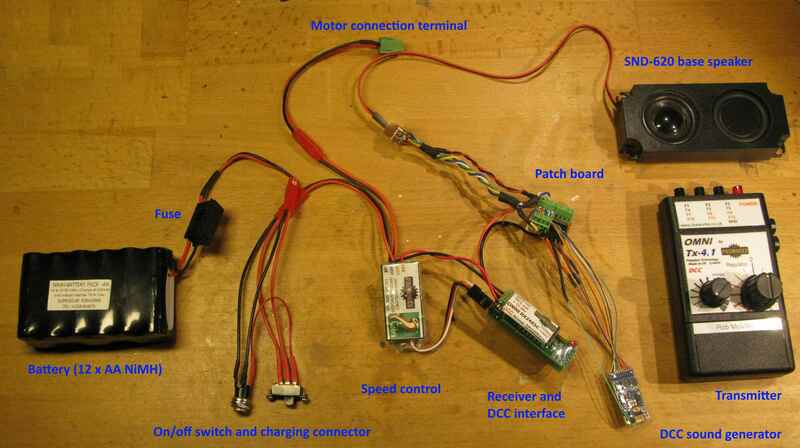 I didn't have a speed controller at this point so I just wired the motors directly to a 7.2 V battery pack I had lying around and made a circle of Peco G45 track to see how it would go. It certainly went; click on the link below to see how and refresh this page if no YouTube video image appears below this text, sometimes it doesn't load on the first attempt. 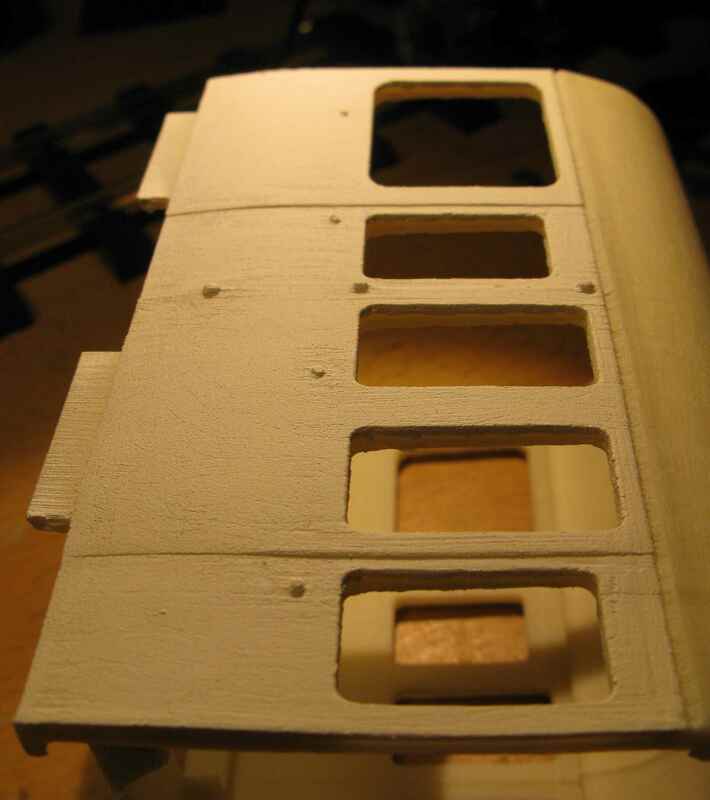 Having made the main part of the chassis, I spent some time creating and 3D printing the undercarriage, which included a box to house the electronics and some very intricate chassis sides. Since these were too long for my 3D printer to print in one go, I made them in several parts and created a jigsaw pattern (with 0.2 mm clearance left between the jigsaw edges) to knit them together. 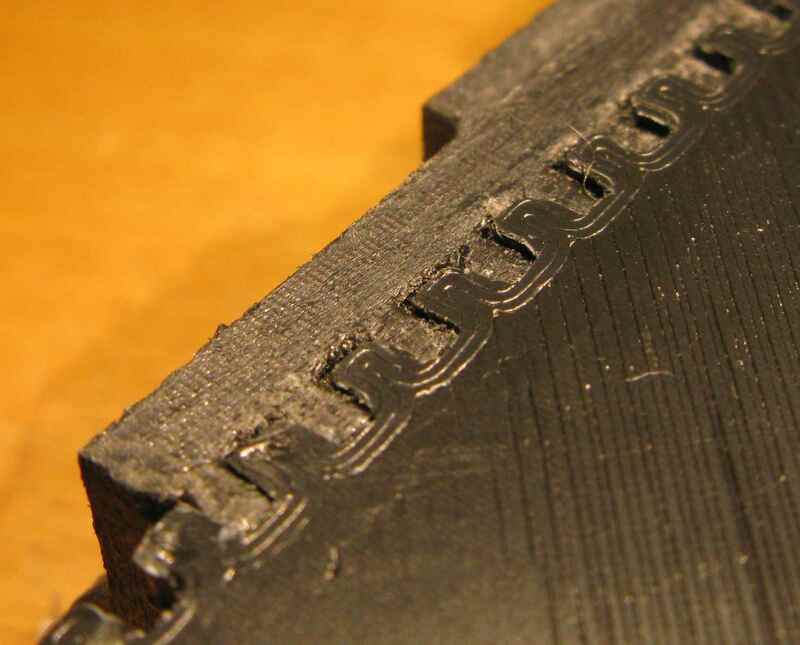 The key with the intricate chassis sides, even with a high resolution print, was careful finishing: I purchased what became a really indispensable Herzo hand-held rechargeable grinding tool and used it to roughen-out the ridge marks left on the top surfaces of the black ASA by the 3D printing process. 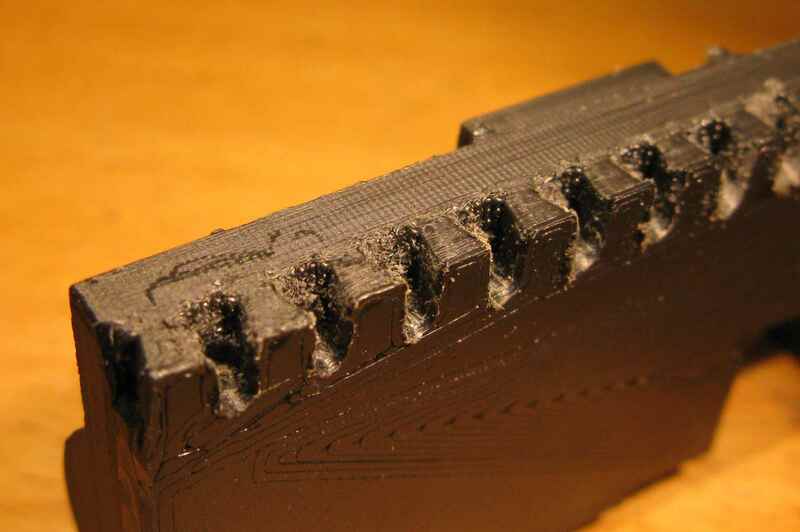 You can see this in the "before and after" picture below where the top part is not yet finished: it has obvious 3D printing horizontal surface zig-zags and stepping, while the lower part has been finished, taking about 15 minutes with the Herzo, usually on its lowest speed setting. 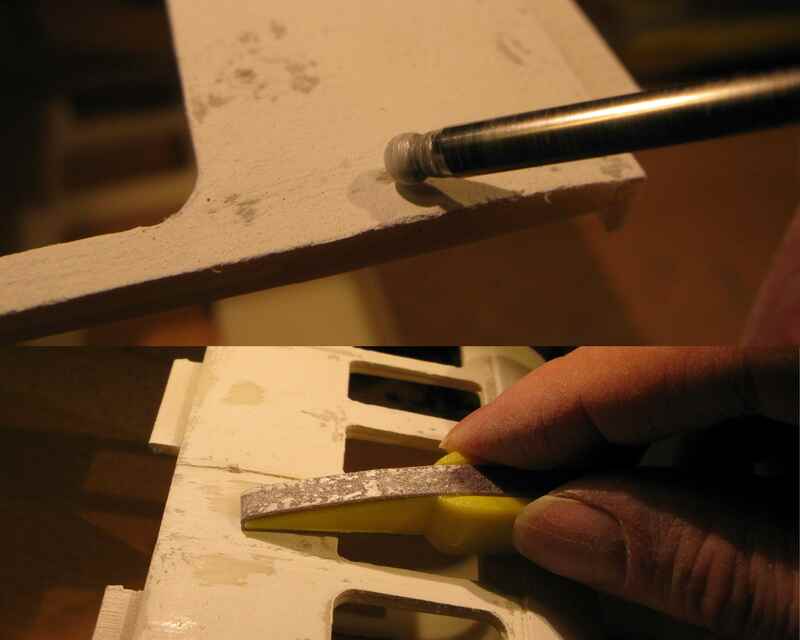 After making sure that the jigsaw edges were nice and clean I was able to carefully squidge the lot together using a wooden-jawed vice, no glue required. 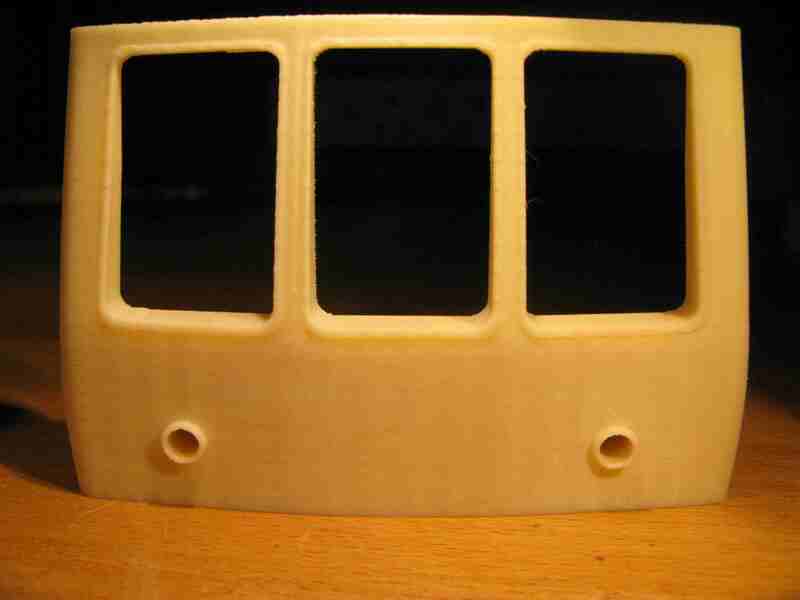 For the means of attaching the 3D printed parts to the aluminium chassis base, see the body section below. Here's a comparison with the real thing; good enough for me. 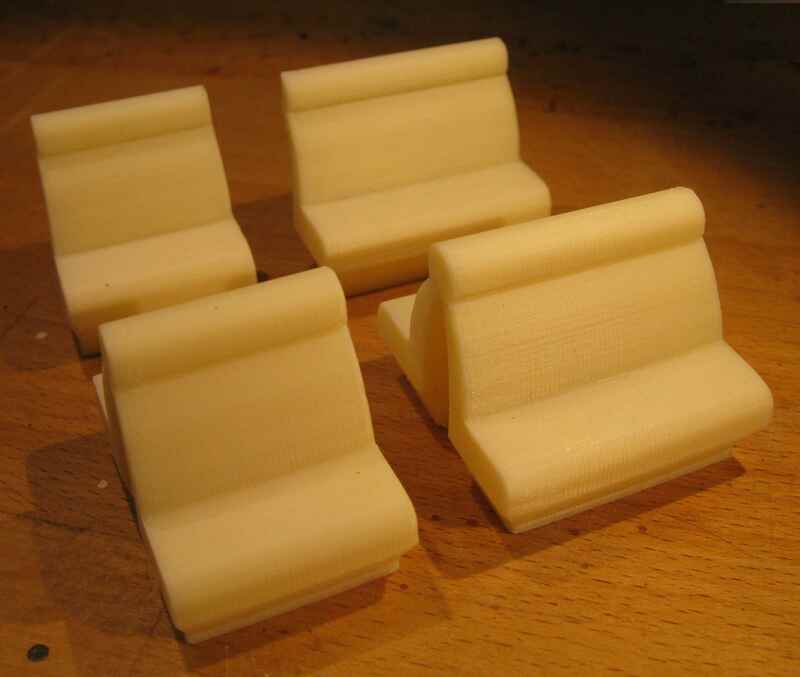 After some experimenting I decide that the buffer bars were best 3D printed; that way I could incorporate into them all of the necessary retainers/aligners for the buffers and the couplers. 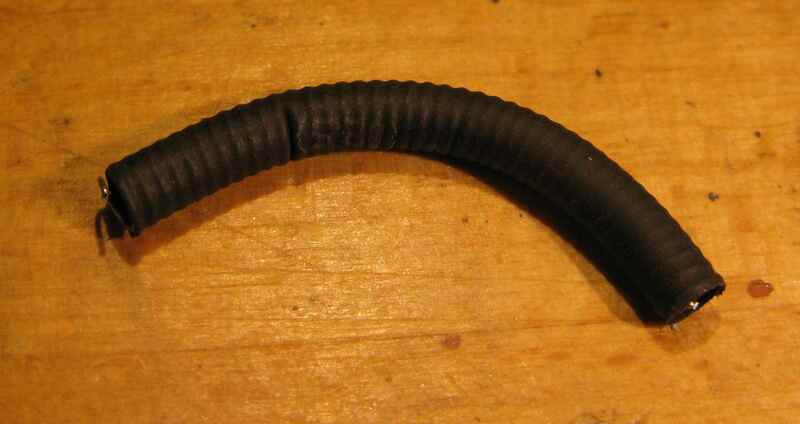 The umbilicals were made from two 35 mm lengths of 2.5 mm diameter heat shrinkable tubing, the kind of stuff you would use to hold wiring neatly in electronics, and some lengths of 2 mm diameter coiled spring purchased off Ebay. 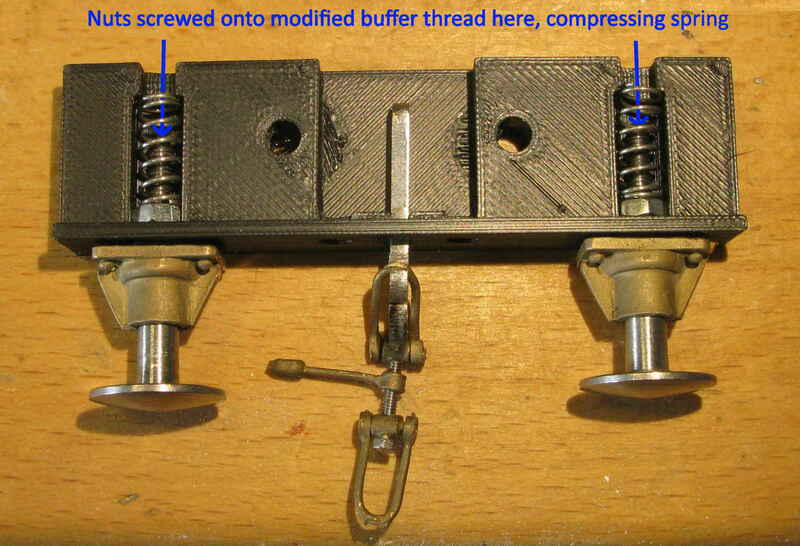 The spring was "screwed" inside the heat shrinkable sleeving and then, with the tube held around a suitably sized former (e.g. 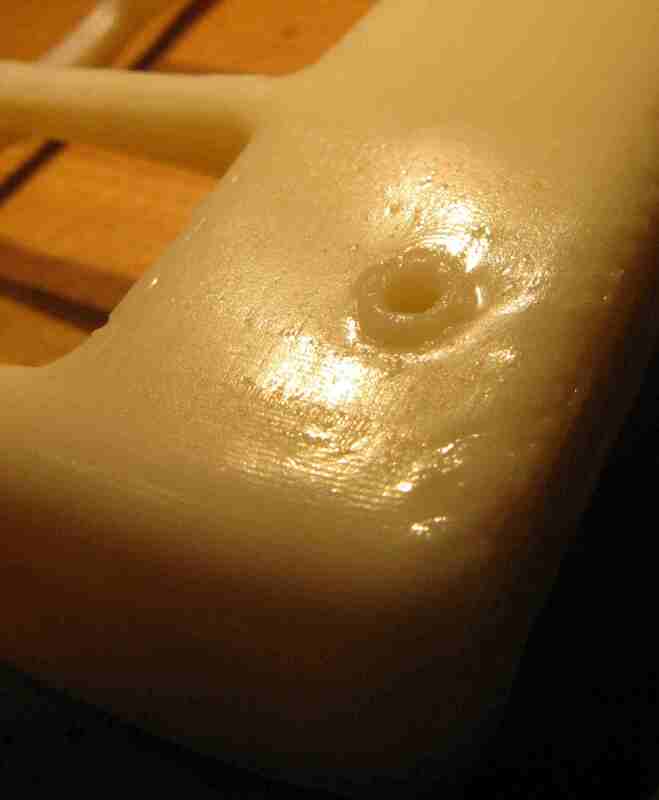 a plastic bottle top), heat was applied with a hair drier. 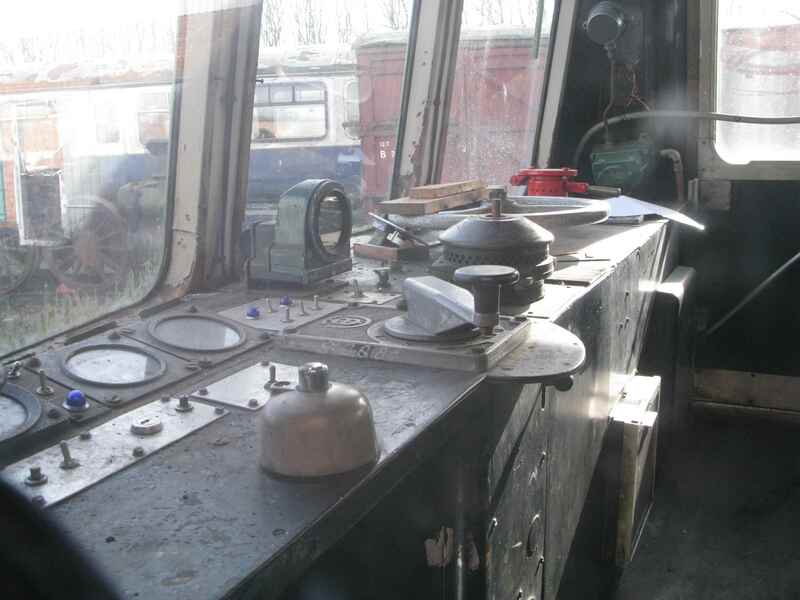 The buffers and couplings were purchased from Tenmille: BR MK1 brass buffers AG312 and screw coupling kit AG257. 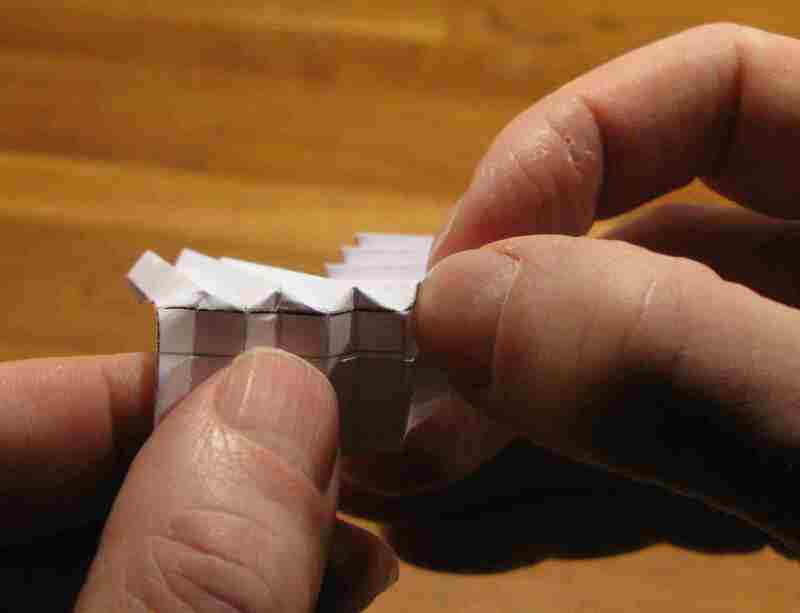 They are shown here loosely assembled. 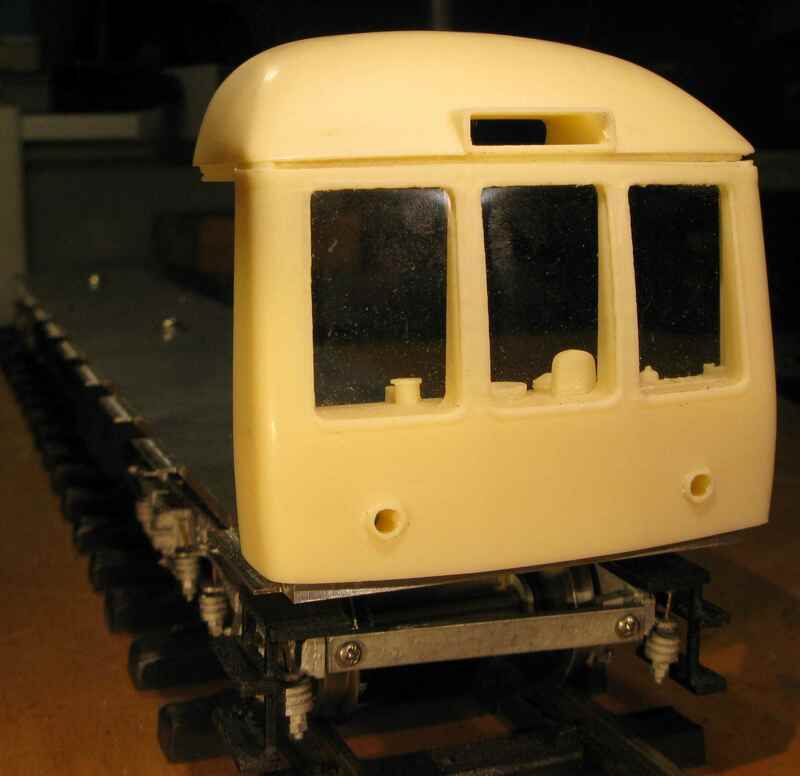 However, that gave me oval buffers not round ones, so Tenmille found me some BR MK1 buffers with round heads, steel this time, which required a little modification: the existing (BA?) 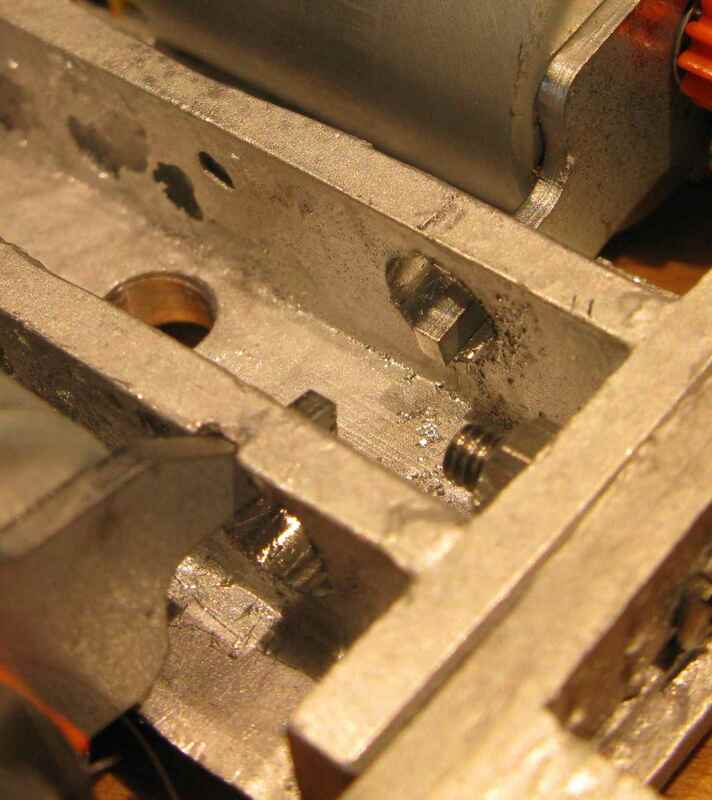 thread on the buffer stem was extended with an M3 die to 12 mm long from the original 6 mm and an M3 nut was tightened on it once the buffer was inserted into the brass mount and the buffer bar; this served to secure the buffer and provide a surface for the spring to push against. 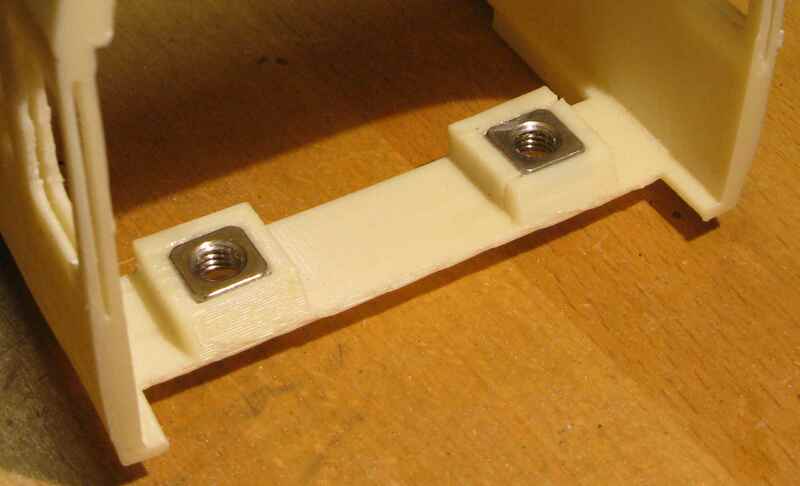 As you can see, I also added two 4 mm holes (with nut-traps on the underside) to fix the buffer bar to the aluminium chassis plate using two 10 mm long M4 counter-sunk head bolts; these won't obstruct the mounting of the body given the corresponding counter-sinking of the holes in the aluminium plate. Just to be sure, I made a segment of track of the worst possible radius for my front garden railway (i.e. 1 metre) and checked that the coupling worked under those conditions. For the electronics I went with a Fosworks rig, built by them to order and including the wonderful Legomanbiffo sound. The sounds are loaded onto a DCC chip and hence I needed a transceiver that spoke DCC, which made for a lot of small boards and required 12 V power. 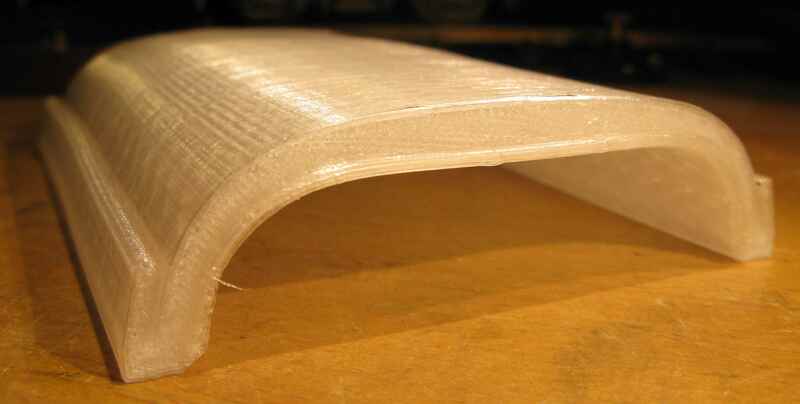 The boards all fit into a box that is part of the 3D printed undercarriage design. Of course, I could probably have made more of an effort myself and put together the system more cheaply but, aside from a pause to charge the battery, this professionally pre-wired rig literally worked out of the box, which was very pleasing indeed. 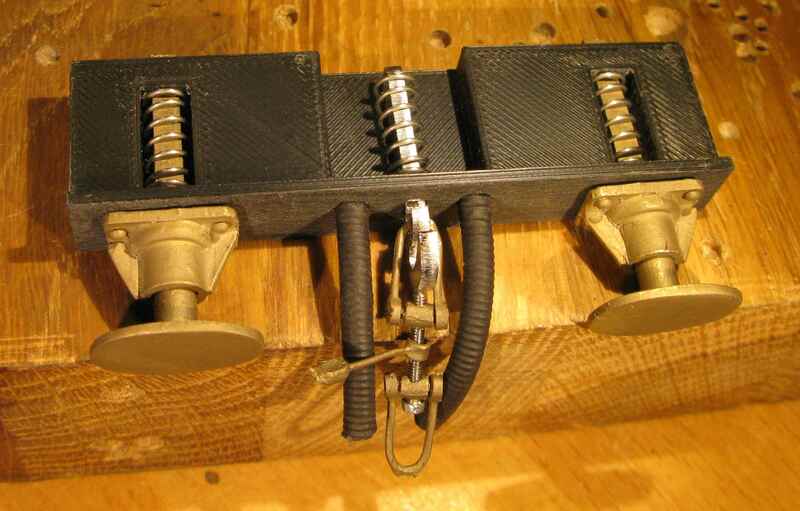 By arrangement with Steve at Fosworks the patch board allowed for connection of forward and rearward lights, two aux outputs that were able to drive cab lights at either end, again direction sensitive, and a further aux output which I used to control the internal carriage lights. 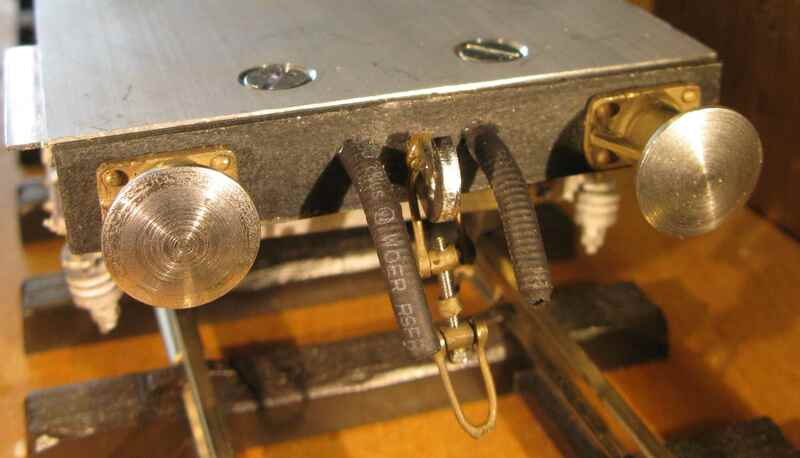 Here it all is stuffed into the chassis box with an added 0.1 inch pitch connector strip, just visible at the top left of the box, from which all of the electronics inside the body will be fed, cables entering the box through the 6 mm hole in the middle of the chassis base. Click on the link below to see/hear a control/sound test; refresh this page if no YouTube video image appears below this text, sometimes it doesn't load on the first attempt. 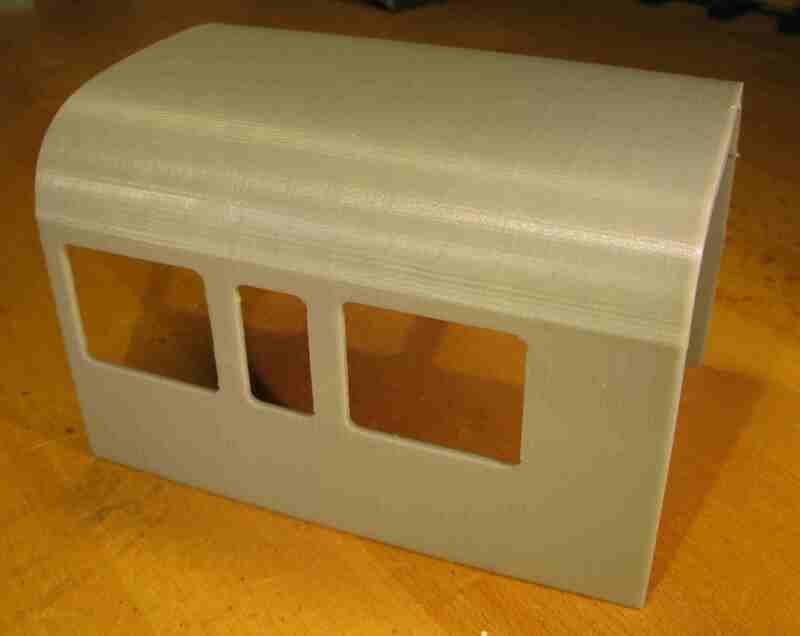 While showing the 3D printed cabin off at work one lunchtime I was asked why wasn't planning to 3D printed the rest of the body. 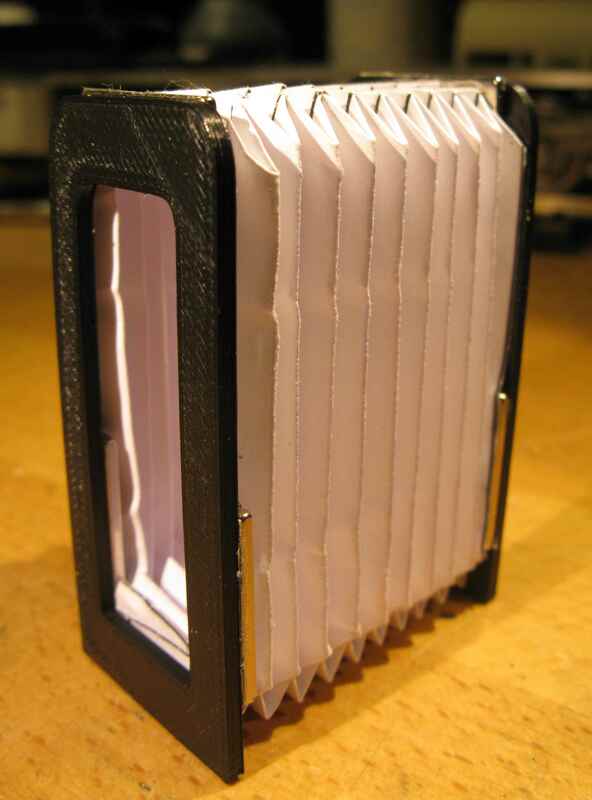 Given what I've learned about 3D printing, and what I don't know about folding aluminium sheet, it was worth considering. 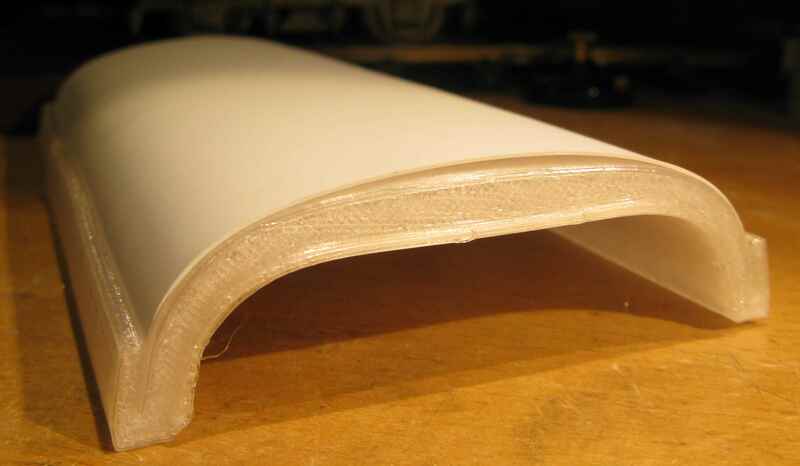 The entire body of one coach works out to be about 600 mm long while my printer maximum vertical dimension (the body would need to be printed vertically to avoid a large support structure) is about 200 mm, and I'd want to stay well below that as shapes can become unstable and print a bit "raggedy" as they get higher. 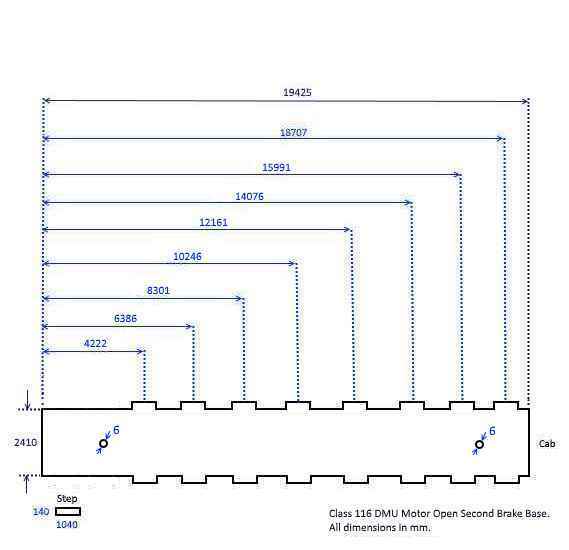 So it would need to be split up into 4 or 5 sections. 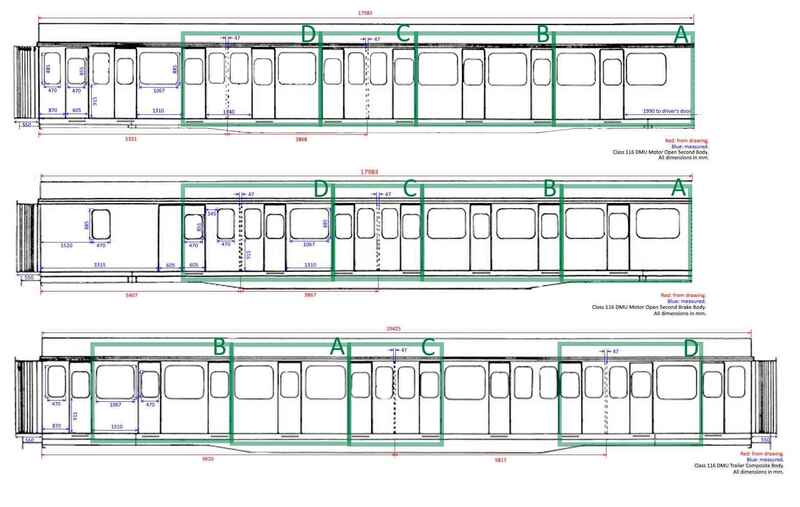 This is quite possible since the coach side is split vertically at each door section (see below). 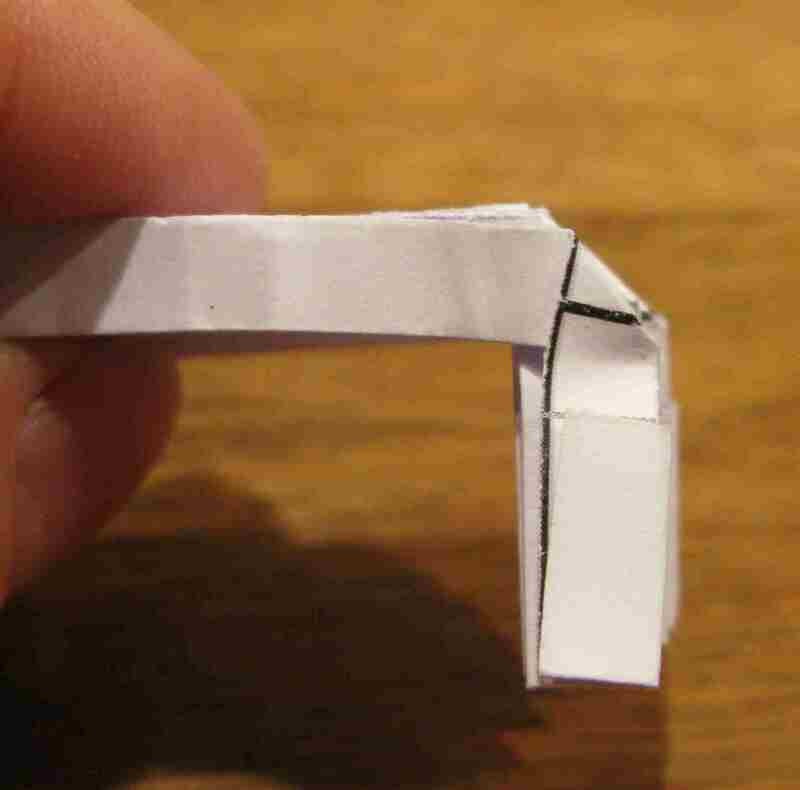 I could use a guttering strip around the top and covering material of some form on the roof to hide the rest of the joint. 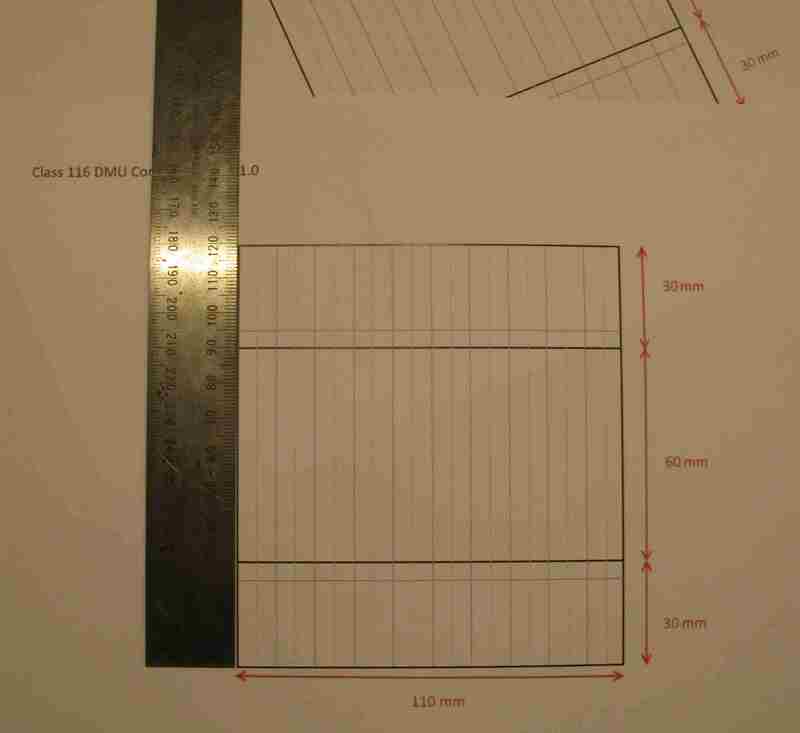 And the bodies have repeating sections which would reduce the amount of design work required. I had a quick go at a test print of the "A" section above and that worked out pretty well, see below. The remaining question was that of access. 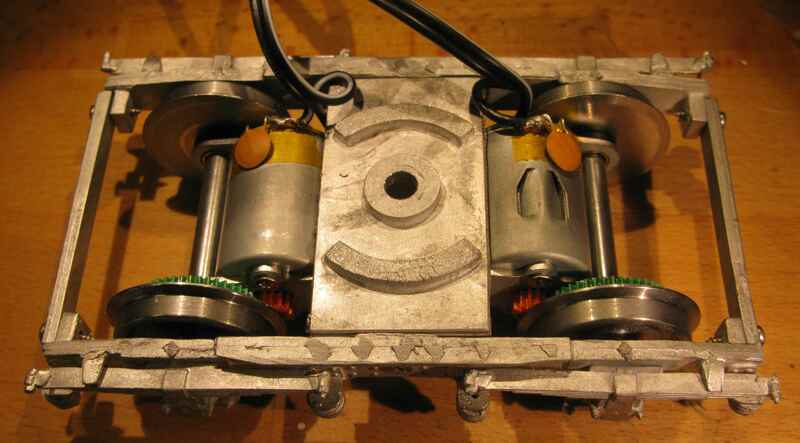 I wanted to be able to get into the body for maintenance but I also wanted it to be rigid and firmly attached to the aluminium base of the chassis. 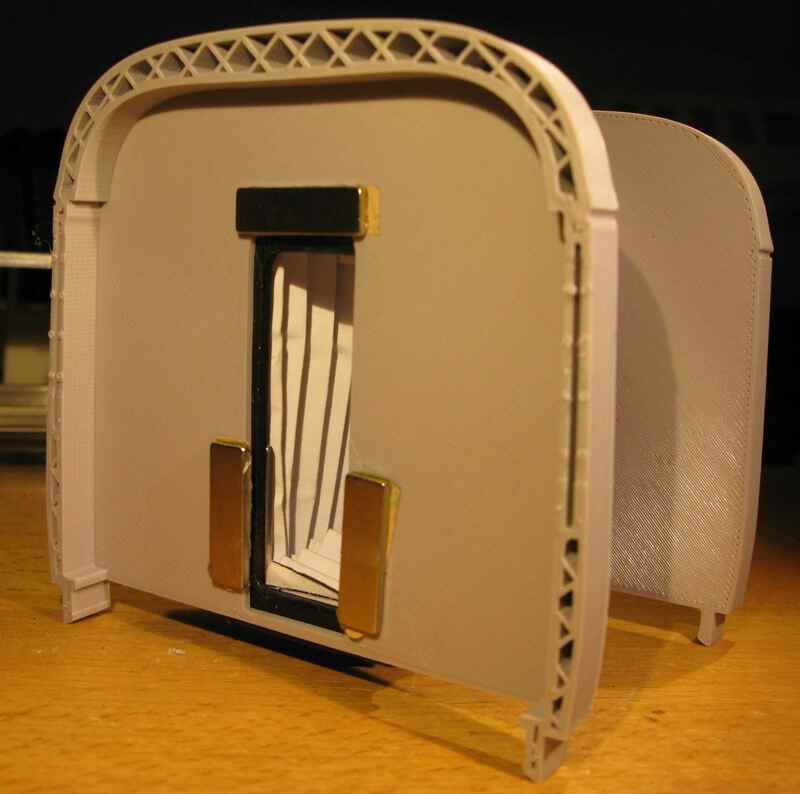 In the end I decided to add a rim around the bottom edge with the slightest of clips to attach the body to the aluminium base and, by default, for the body to form a closed loop, i.e. including a floor. 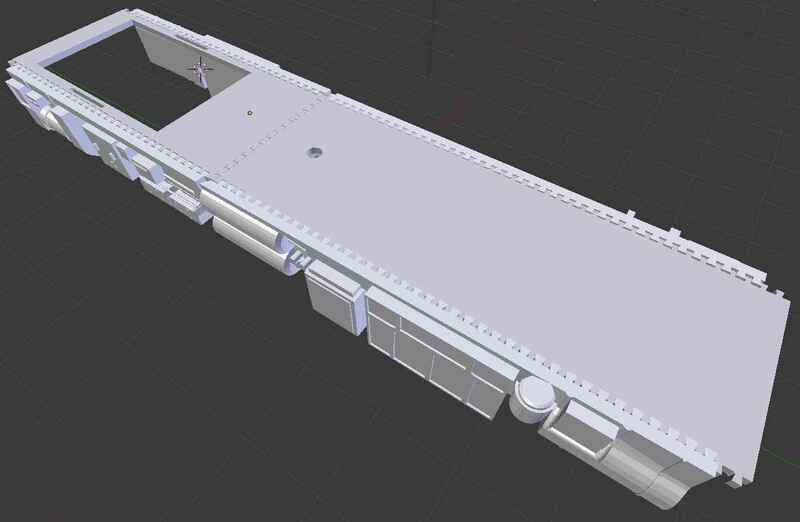 This floor is actually only maintained around two sets of holes for more M6 bolts that will hold the chassis detail in place; the remaining portions of the body floor will be cut away (in the Blender model) to allow access. 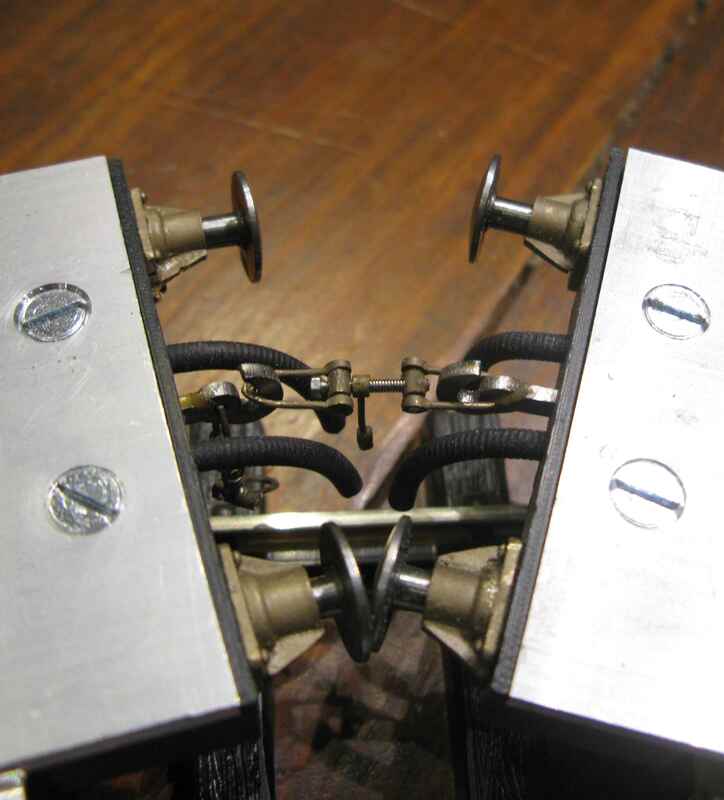 I created traps in the floor to hold the nuts so that the bolts can come up from below; hence the bolts anchor the body to the base as well as the chassis detail. 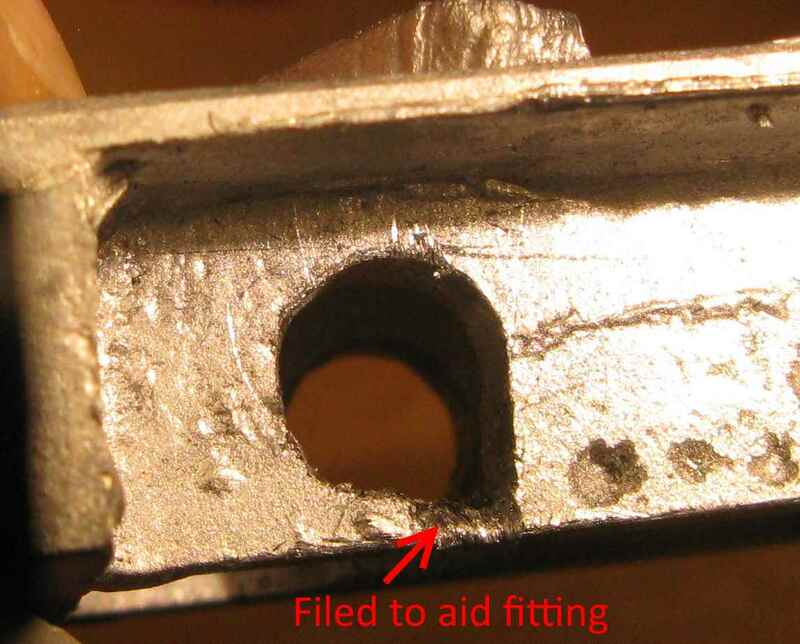 The ASA-printed traps had a slight tendency to crack when inserting the nuts but this was nothing a little cyanoacrylate adhesive couldn't fix. 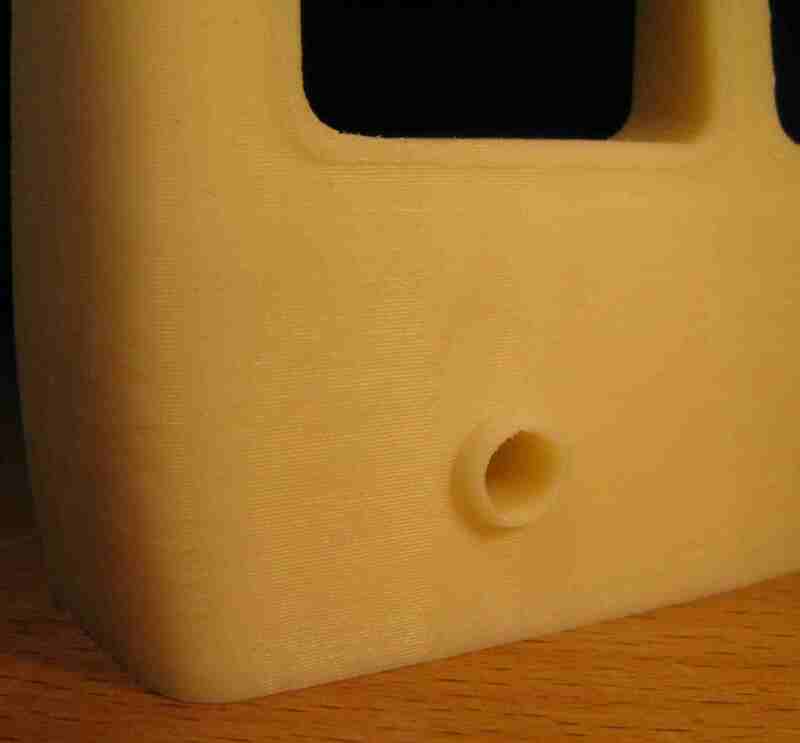 The required holes in the aluminium and the chassis 3D printed parts will be drilled only once the body is assembled to allow for alignment slop. 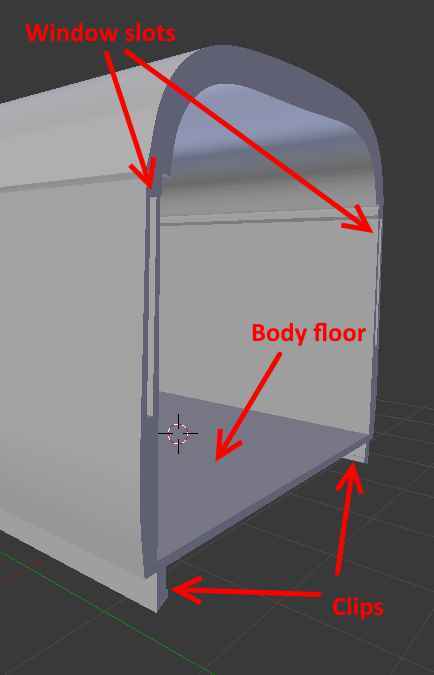 Note, also, the slots in the Blender image of the body sides for windows to be inserted. 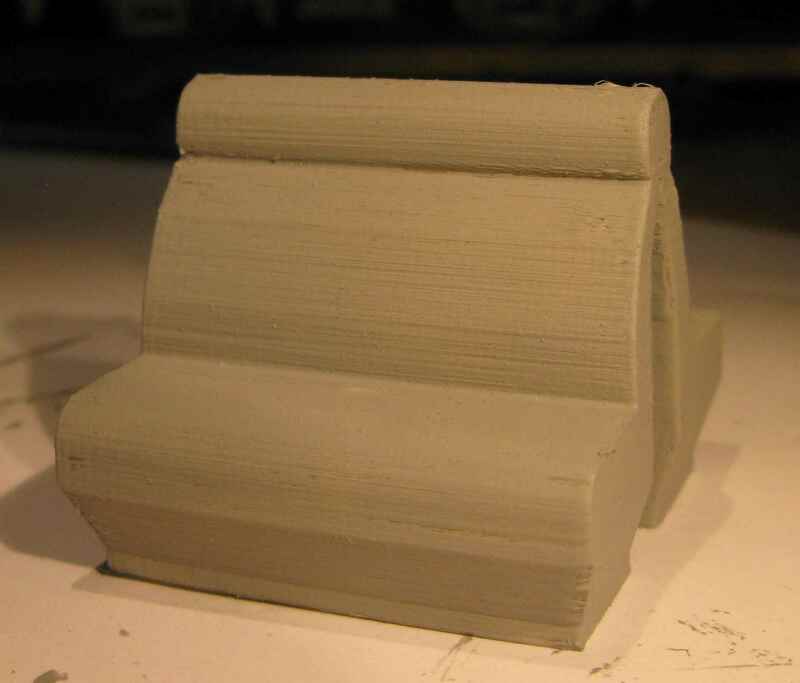 It took several weeks each to design/test-print the sections before final printing in natural ASA at 0.15 mm resolution. 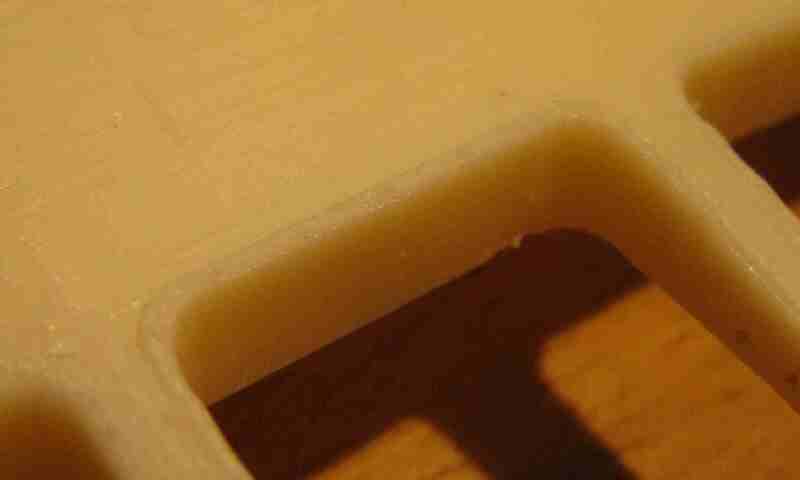 I abraded the outside of each section pretty vigorously with grit 80 on an abrading stick, while avoiding removing features, the aim being to remove the "3D printed" look. 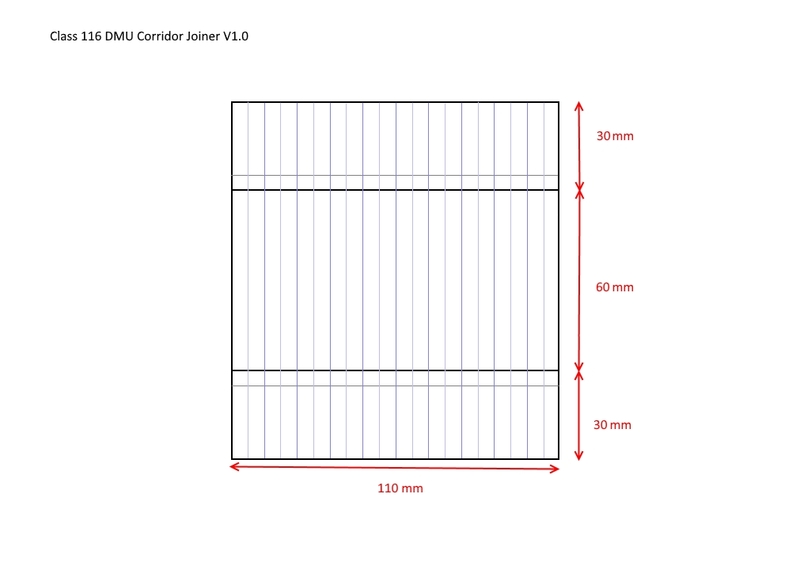 Before I could complete printing the body I needed to figure out how the corridor joiners should work. 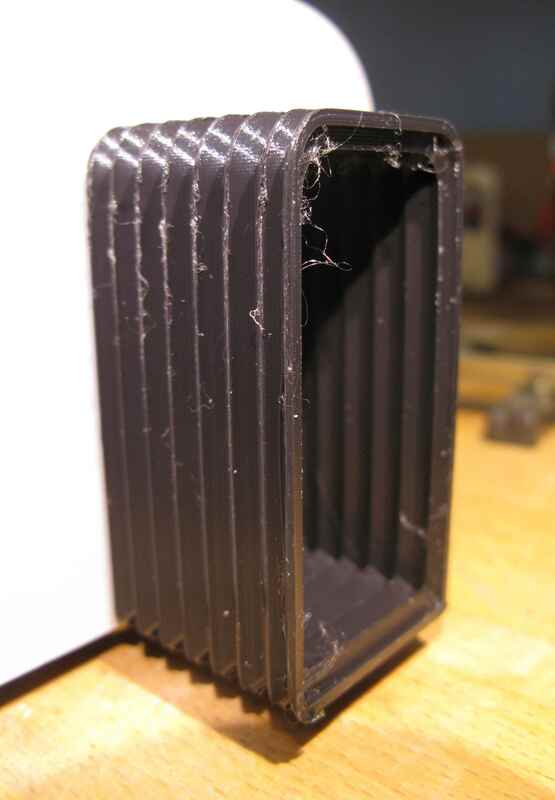 I tried 3D printing one out of Flexible PLA (from rigid.ink) which is really flexible and looks good but, despite being as thin as I could make without causing the printer to leave holes in the shape, the square nature of the structure meant that it wasn't concertina-style side-to-side flexible as I needed it to be. However, at this point I had completed all of the 3D printable parts in Blender and, while up to now I had simply been using Blender as a means of creating printable shapes, it occurred to me that I could put all of the parts together, colour them and create a properly animated/rendered video tour. Here it is; refresh this page if no YouTube video image appears below this text, sometimes it doesn't load on the first attempt. 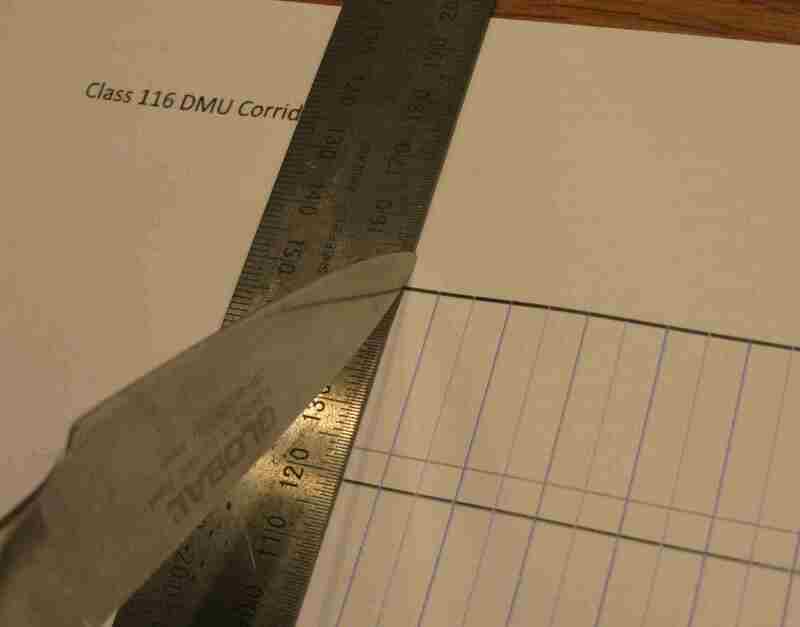 But back to the corridor joiner; I turned to latex. 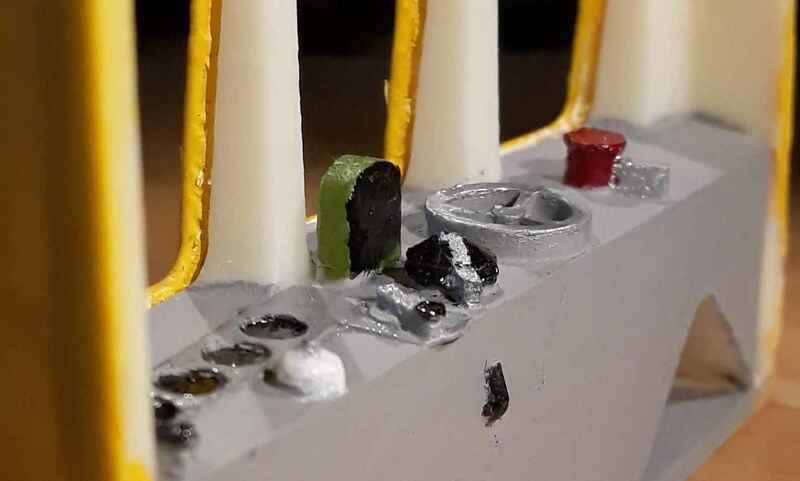 I tried 3D printing a mould from PLA and ribs from black ASA, then painting black latex on the inside of the mould, inserting the ribs, painting more latex etc., building up a few layers. That was messy and still not flexible enough. 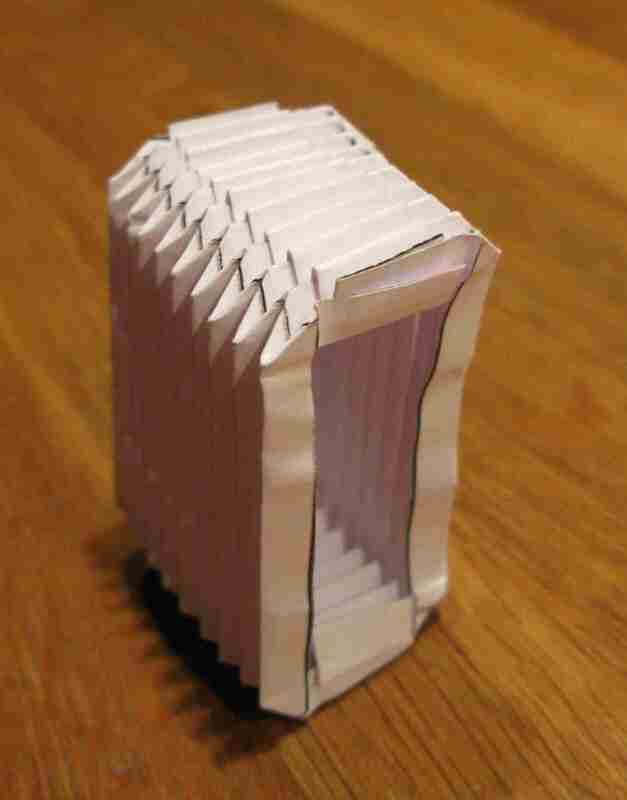 However, during a lunchtime conversation at work the subject of origami came up and John subsequently brought in his copy of Steve and Megumi Biddle's The New Origami plus a test folding of their "Troublewit" design, a concertina-shaped thingy which looked pretty much perfect aside from the scale. After satisfying myself that this could be painted with black latex (much easier than painting the inside of a mould) I set to scaling it down. 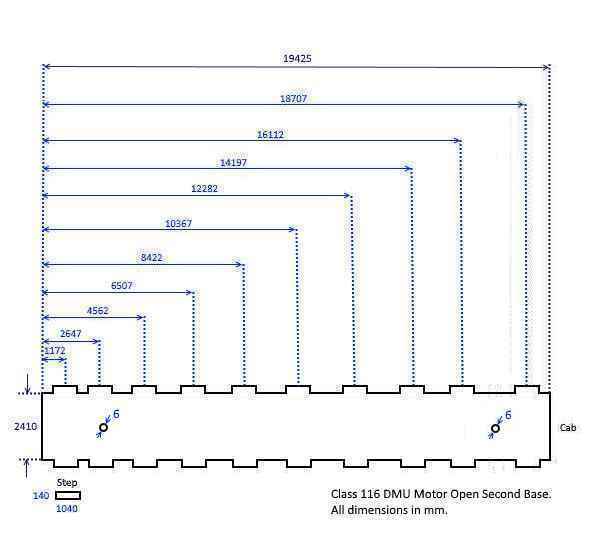 The image below was the result. 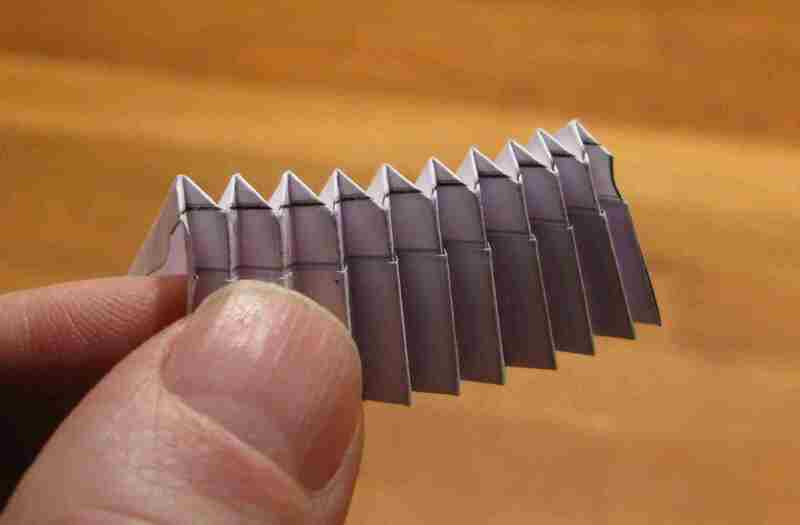 here's the tricky bit - pull out the start of the upper edge that was folded down in step 3 and, allowing the concertina to expand so that the paper doesn't rip, work along using a thumbnail to gently push each peak of the concertina inwards so that the concertina can be compressed once more with the folded-out side at 90 degrees: the paper will want to do this, the thumbnail is helping it; if the folded-out part is not quite at 90 degrees, continue to adjust the peaks until it is. 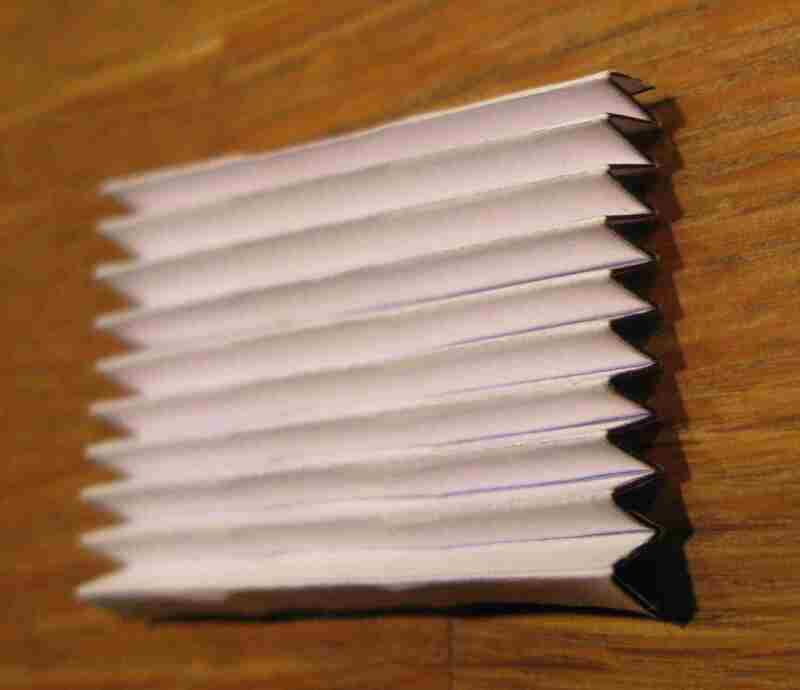 repeat steps 2 to 8 for the other sheet of paper that was printed-out in step 1 and then meld the two half-corridors together, tacking them to each other with a tiny amount of PVA in a few spots just to stop them falling apart (making sure that the glue doesn't get in the way of the concertina action); it doesn't matter if the inside is a little wonky, it is the outside that needs to be nice and square. 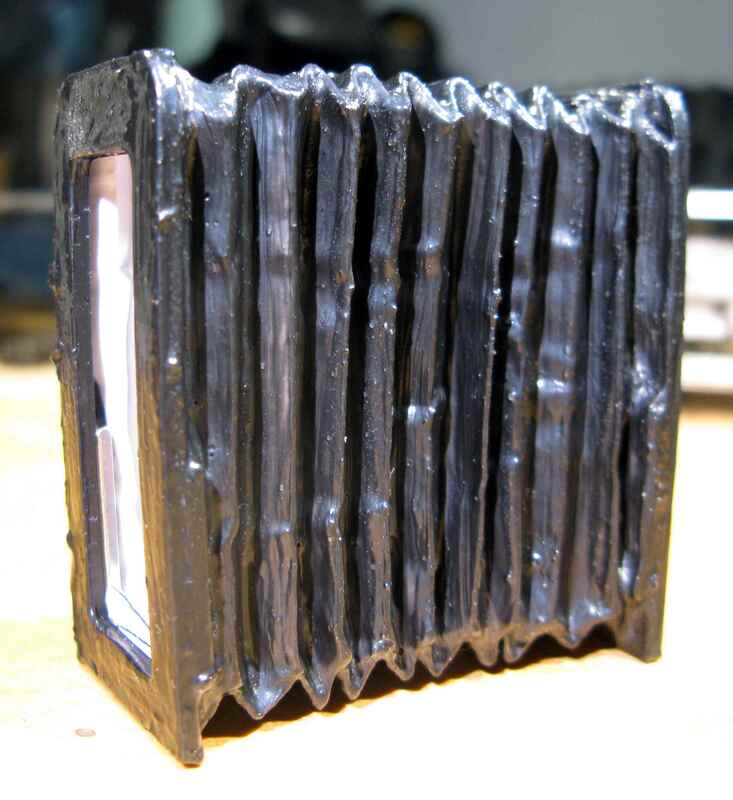 A pair of end plates were then printed in black ASA and three self adhesive 20 x 6 x 1.5 mm neodymium magnets were glued to each of them, one on either side towards the bottom and one at the top. 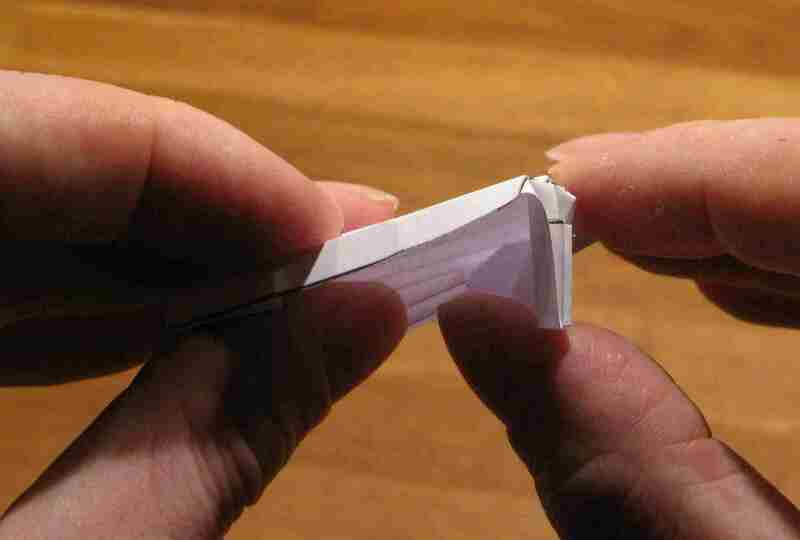 The magnet-sides of these end-plates where then glued to the paper very carefully with cyanoacrylate adhesive. Finally the lot was stretched out slightly and painted with three coats of black latex, allowing several hours drying time between each coat. 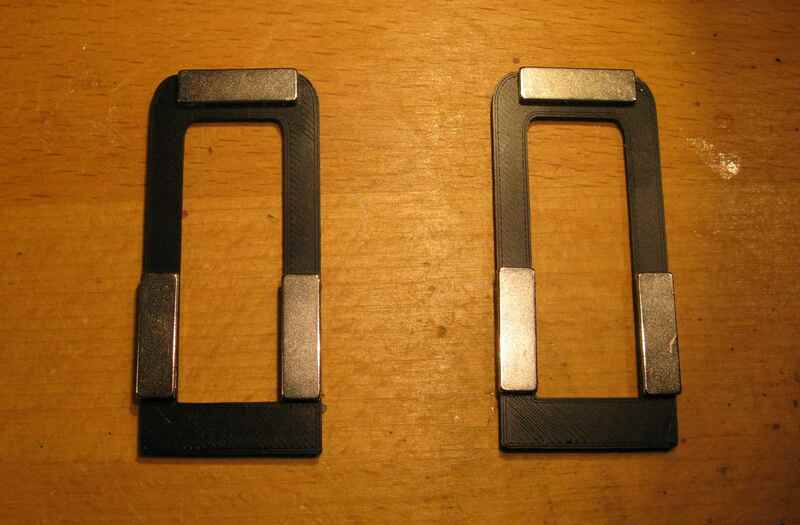 Neodymium magnets of the same dimensions and opposite polarity (i.e. 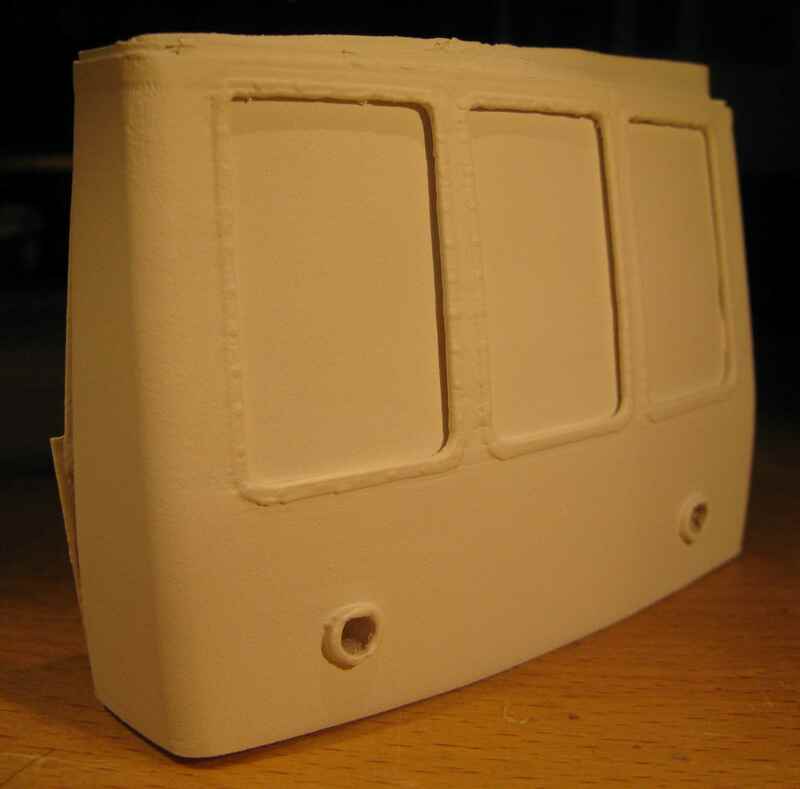 with the adhesive on the other side) were fixed around the inside of the door openings on each coach, giving me an easy magnetic fix, shown below in a test fitting. 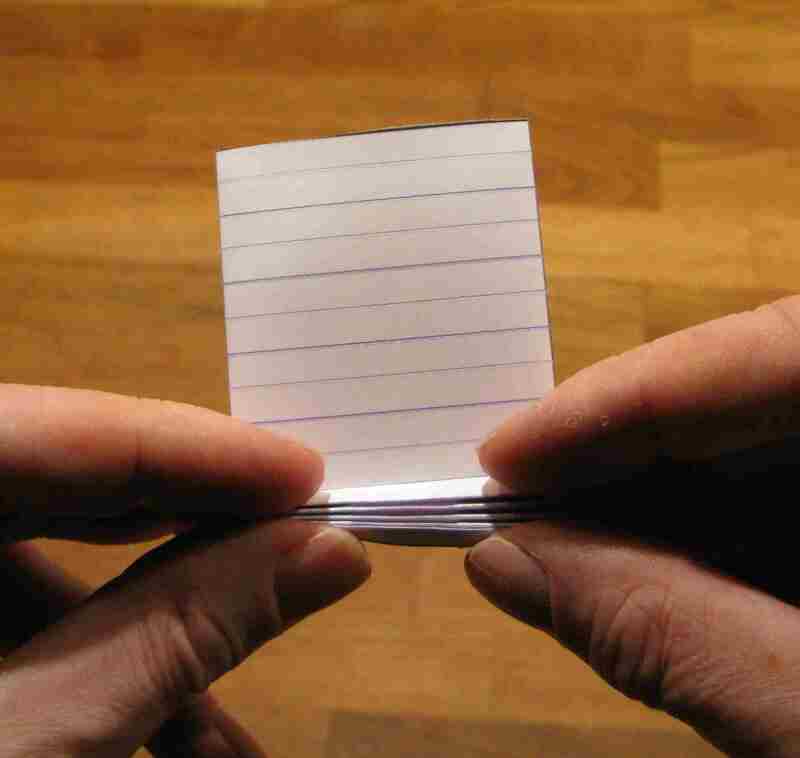 Strong, waterproof and flexible; refresh this page if no YouTube video image appears below this text, sometimes it doesn't load on the first attempt. 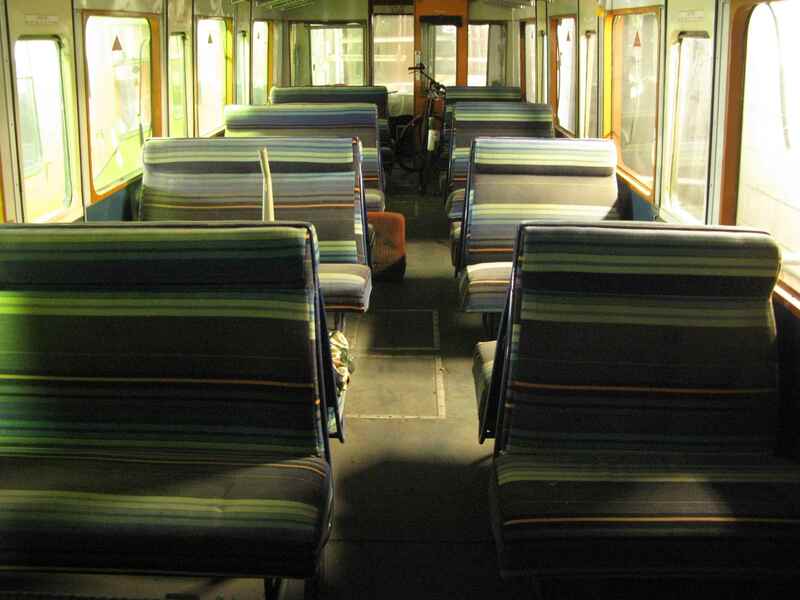 The internal features comprised the seating and partitions; I decided not to attempt any form of luggage rack as it would not be visible from the outside in any case. 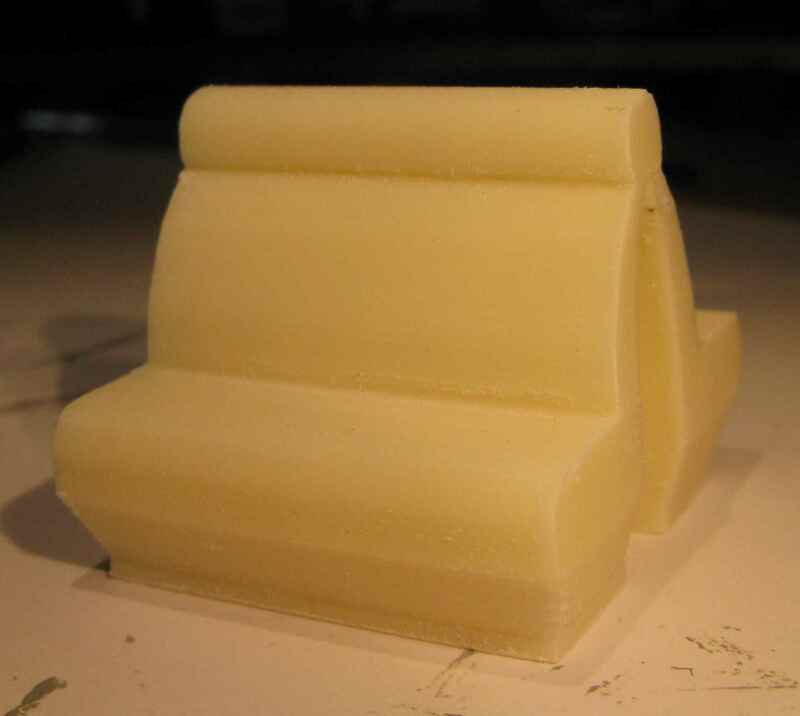 The seats were 3D printed in natural ASA at 0.10 mm resolution which, handily, needed no finishing aside from a quick rough filing of the horizontal seat surface; the ribs of the 3D printing matched the ribbing of the real seat fabric. 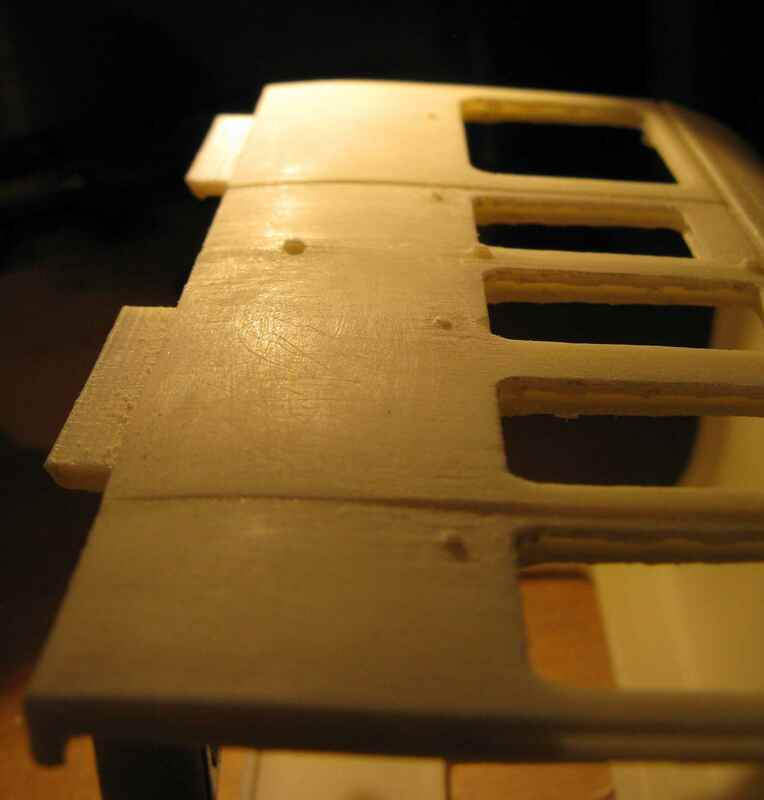 Mounting ridges for the partitions were built into the 3D prints of the body sections to which the 3D-printed partitions were glued. 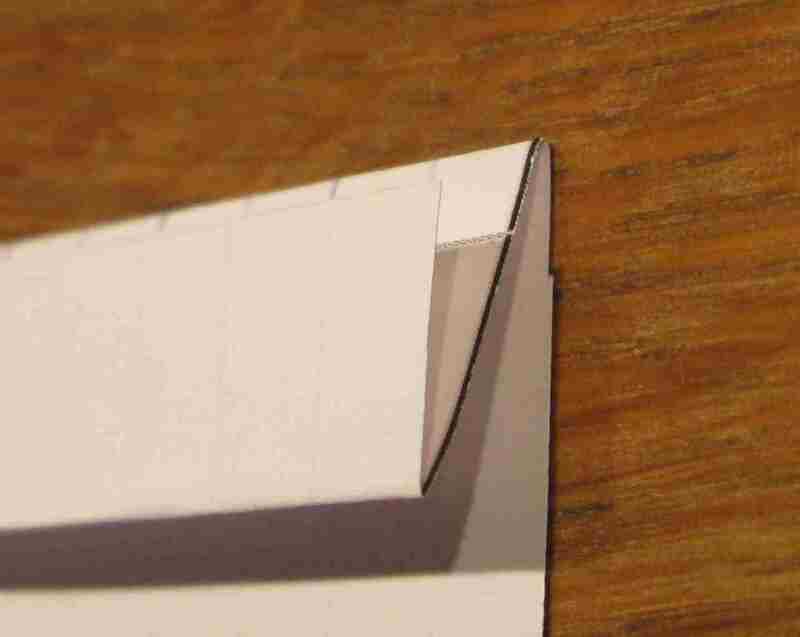 The mid-body partitions were printed in pairs, one glued either side of the ridge to achieve the correct thickness. I began my first painting experiments with the difficult part: the body, the sides of which I painted separately before assembly. 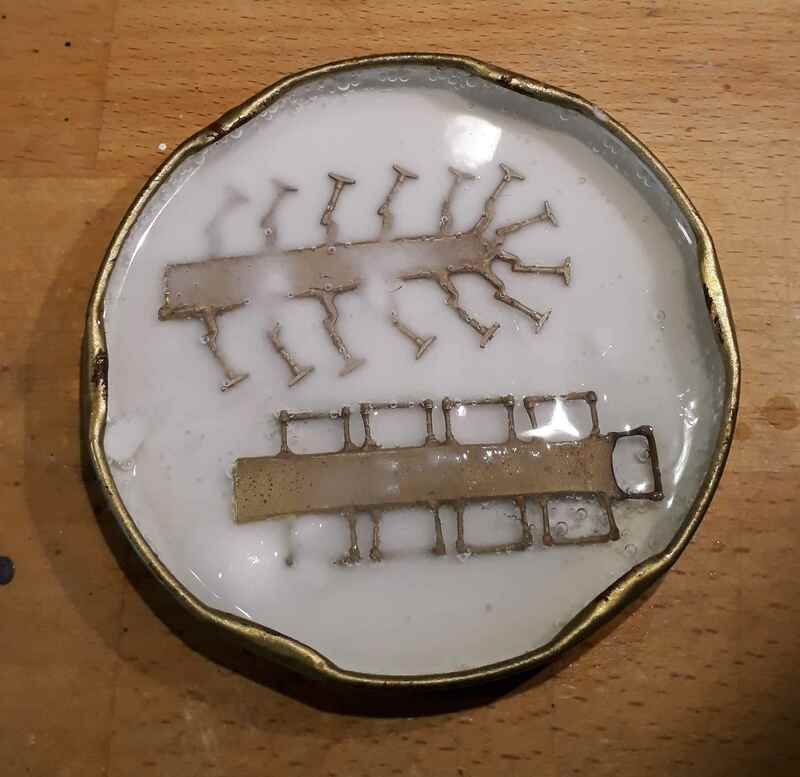 First I abraded the surface further but did not take the time to make it perfect, just removing the 3D printed look, as the first photograph below shows. 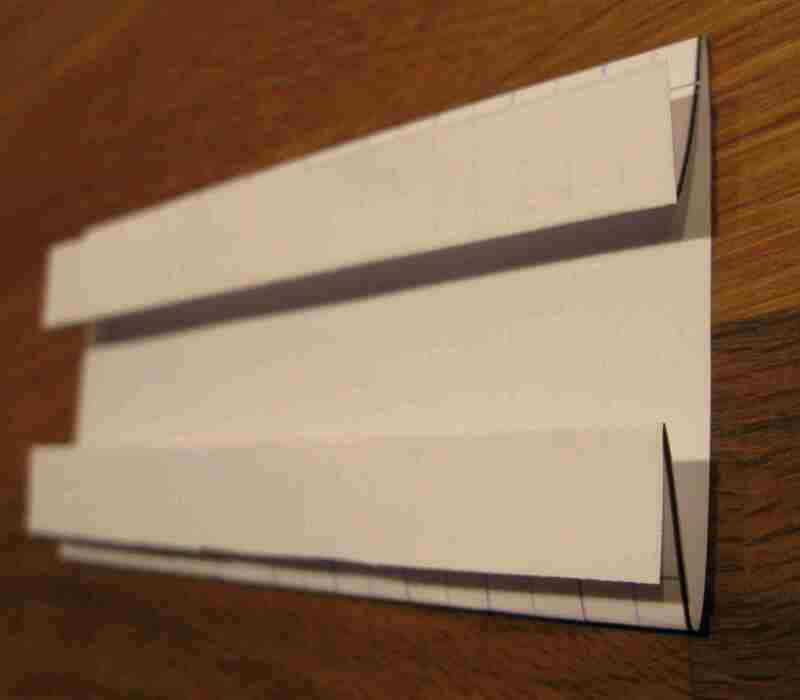 Then I cut a couple of 30 mm wide strips of paper and inserted these in the window slots, adding some masking tape inside to ensure no gaps along the top of the slot, and masked the roof and both ends off with masking tape and paper. 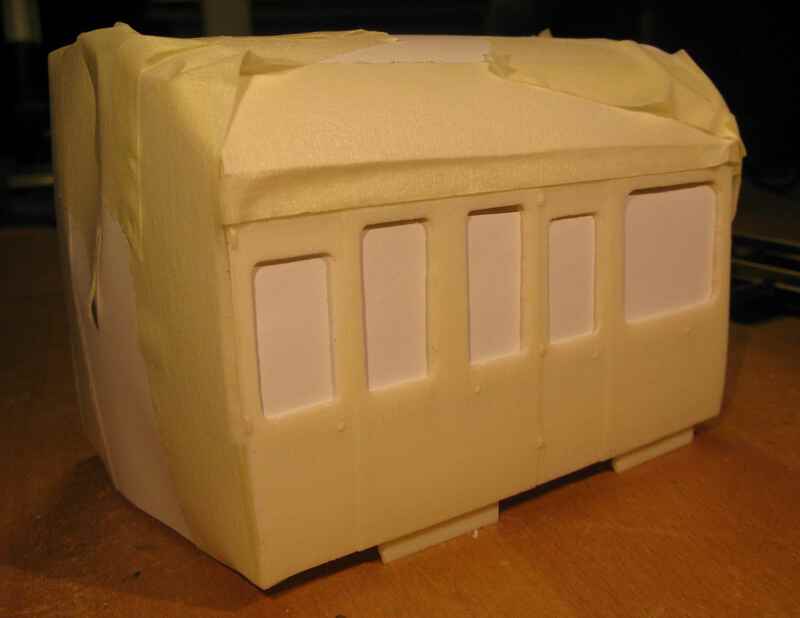 Placing the body section in my littul portable Nielsen spray booth I applied two coats of Halfords (i.e. 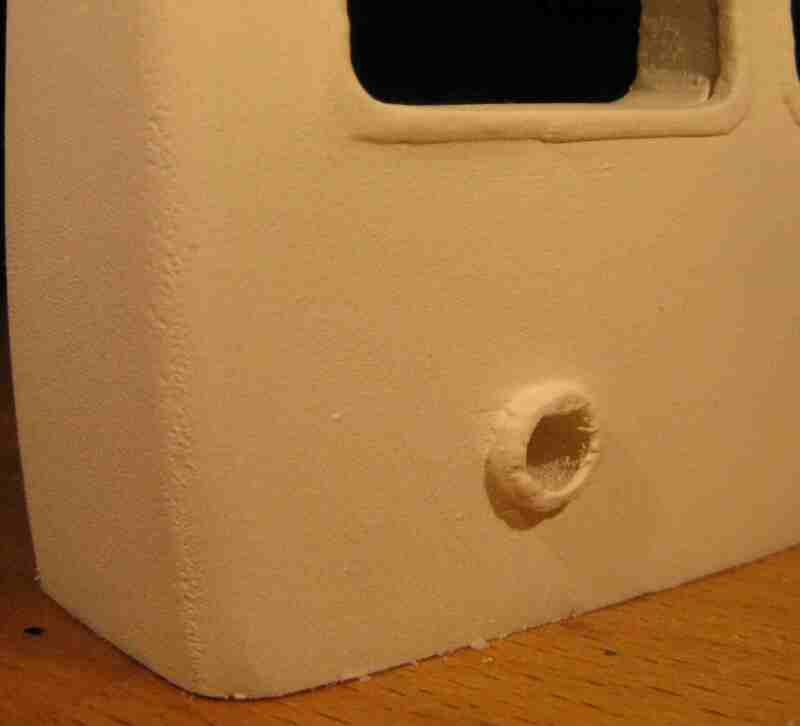 automative) white acrylic primer from a spray can, leaving 15 minutes between coats. Now that I could really see the imperfections properly (I'll be more careful on that first abrading in future) I started again with the rubbing down, this time using my Herzo on its lowest speed setting to get into the trickier parts and finishing with a grit 400 sanding stick before applying another coat of primer and rubbing that down. Good enough; I will improve my technique as I progress with the work, going through the sequence of 80 (plenty of this), 180, 320 and then 400 grit abrading sticks. 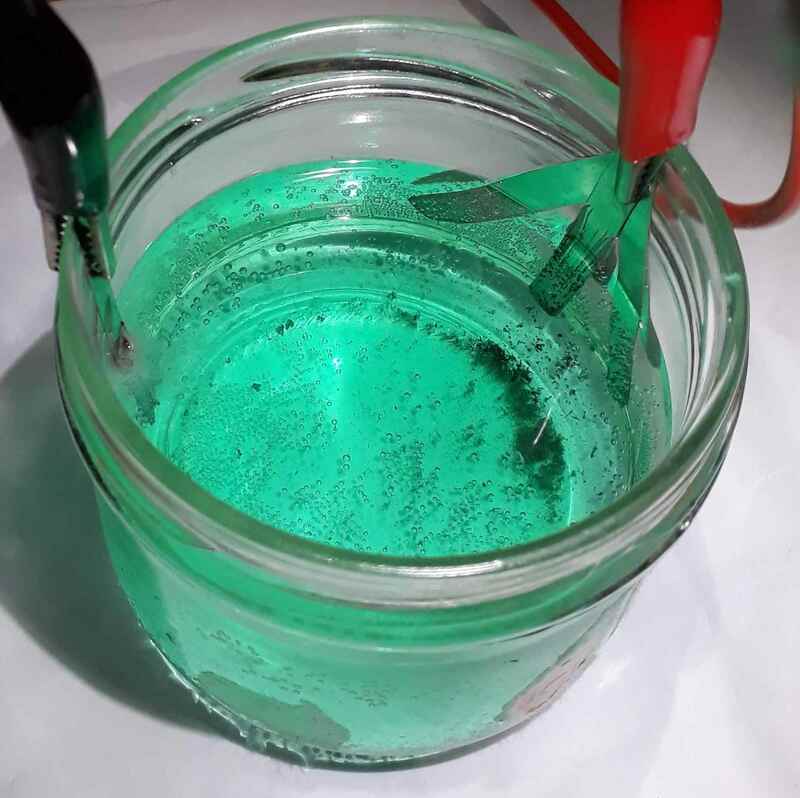 I left this to harden thoroughly for 24 hours; perceived wisdom on the web is that it is OK to apply enamel paint on acrylic primer provided the primer is left to stabilize properly first. 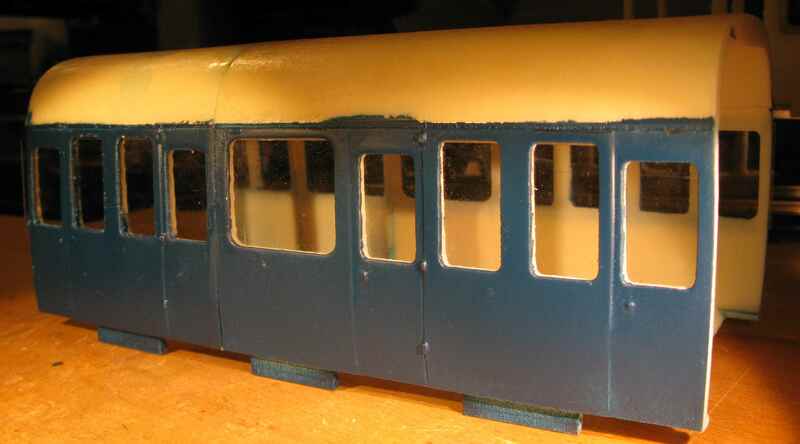 For the final coat on the body sides I first tried using two coats of Railmatch paints RM207 BR Rail Blue (satin), thinned with an equal quantity of enamel thinners and applied with an airbrush. 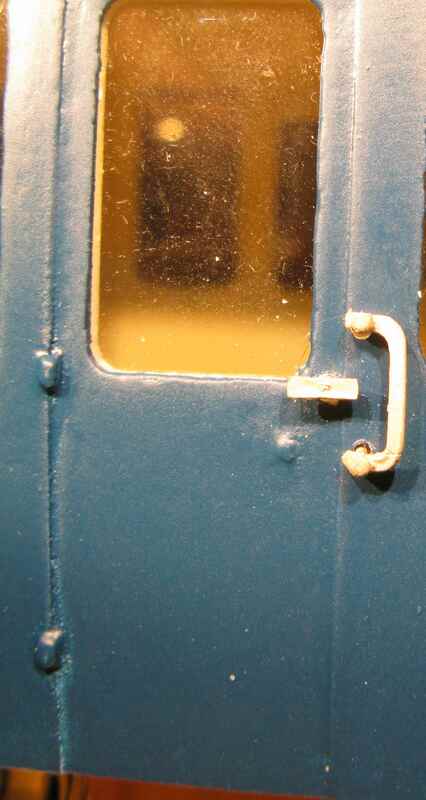 This was the first time I'd used an airbrush and I learned two things: (a) it is very easy to over-thin the paint and achieve a runny result (for Railmatch paints add an equal quantity of thinners at most) and (b) one 15 ml jar of RM207 BR Rail Blue is barely enough to spray a single body section. Later I moved on to using Phoenix Precision Paints P132 BR Rail Blue (dull) which was available in larger quantities, also spray cans, and should be thinned even less (25% thinners). 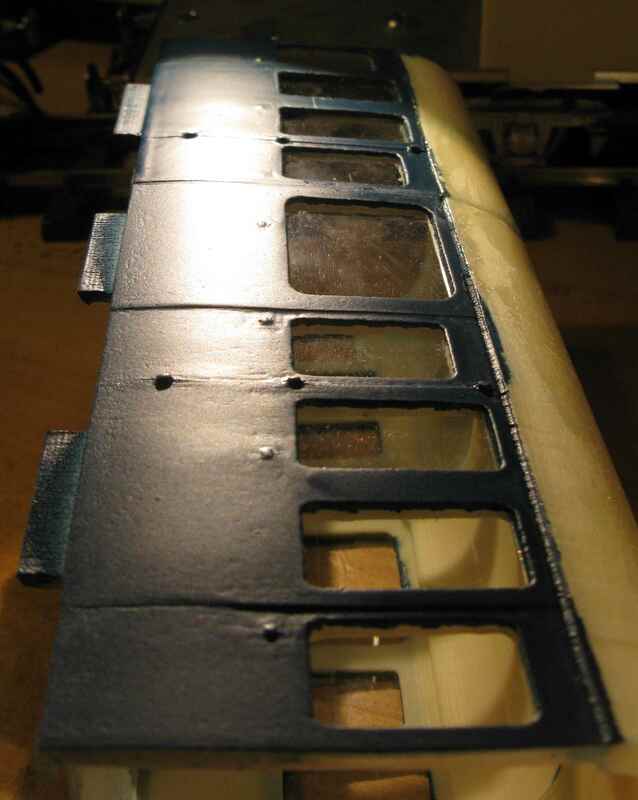 Anyway, I persevered with two test sections, inserted windows and joined the sections with cyanoacrylate adhesive. The finish on the sprayed sides was pretty good and the join was not visible on the sides. That left the roof. 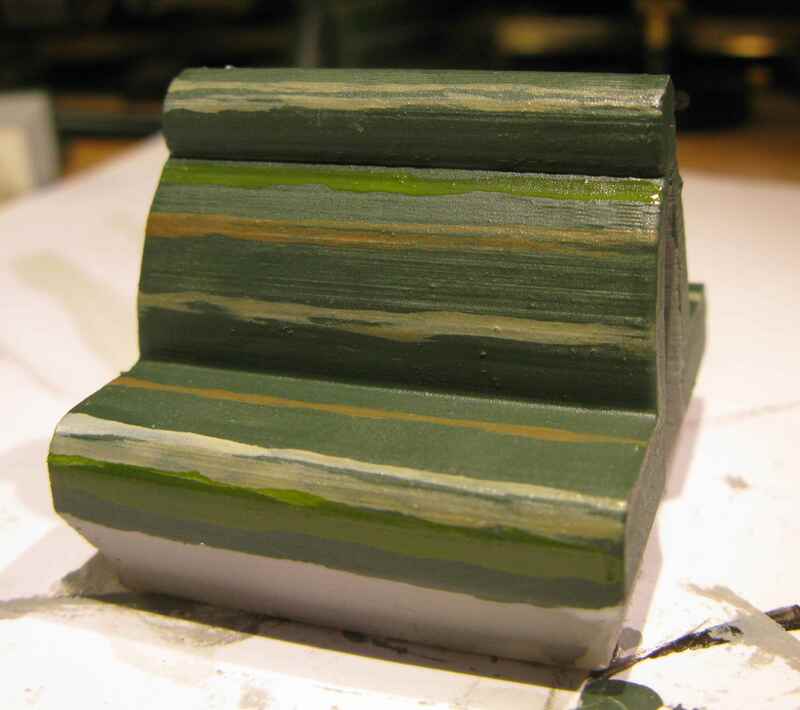 First I tried applying the same black latex as I used for the corridor joiner with a brush but the finish was awful. Then I purchase some matt black polyester Solarfilm, the material one uses on model planes, but it proved impossible to apply neatly to a solid plastic surface; no matter what I did (heating and stretching it with the proper tools, applying additional adhesive in various ways) air bubbles always reappeared underneath the film after it was left to stand for a few hours. 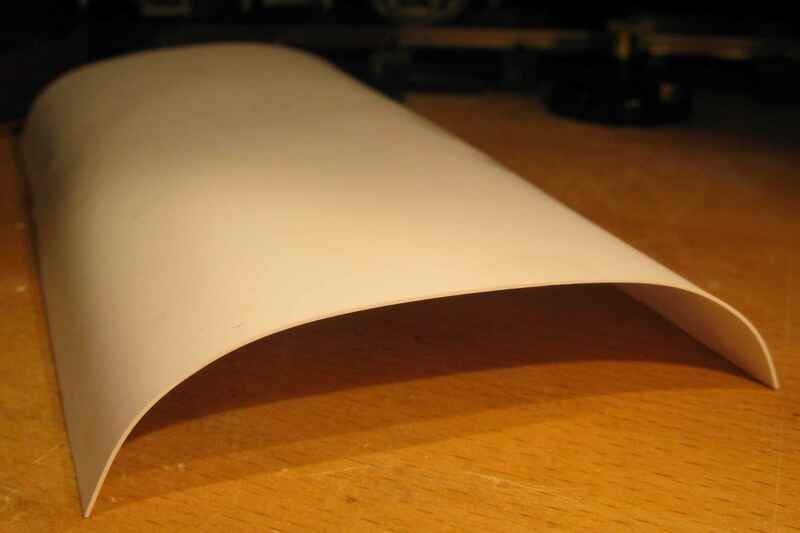 Finally I turned to 0.5 mm thick styrene, purchased in large white sheets (660 mm x 1370 mm) from 4D Model Shop. 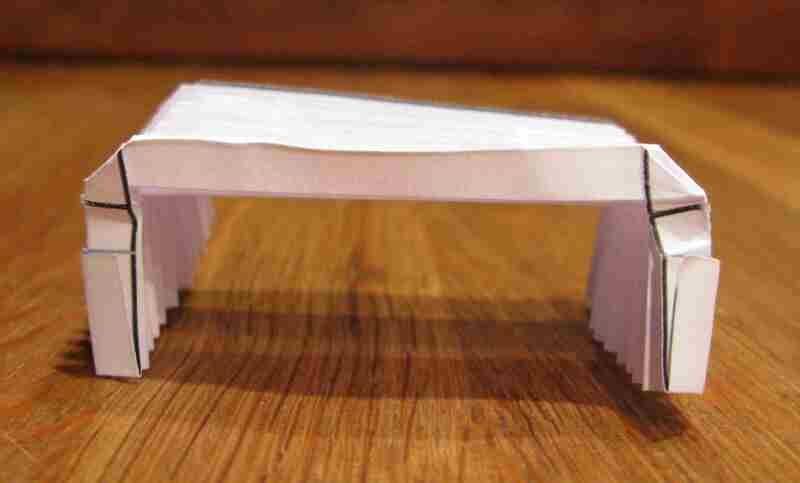 I 3D printed a former the exact size of the roof out of polycarbonate, which is heat resistant to around 140 C, then cut the styrene sheet into a strip 108 mm wide and the length of the straight part of the roof (i.e. up to the start of the curved cabin roof section) and fitted it into the former. 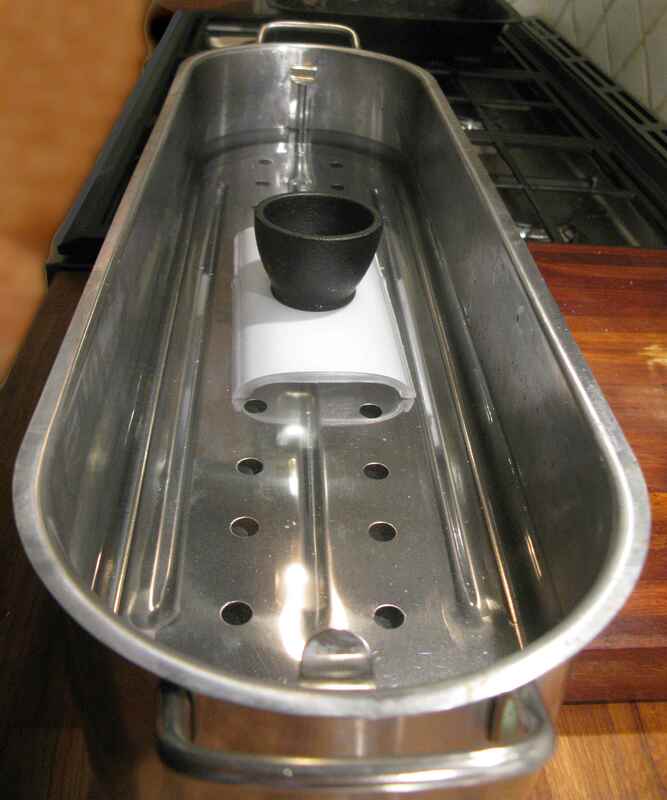 Heat was then applied, in my case by placing the lot into a fish kettle and covering with boiling water for 5 minutes with a weight on top to stop it floating; you could also use an oven turned down to 100 C or you could apply heat evenly with a hairdrier. After test fitting/trimming the roof was sprayed with two coats of grey primer and two coats of matt black acrylic paint (Halfords/automotive again) then glued onto the body with cyanoacrylate adhesive. 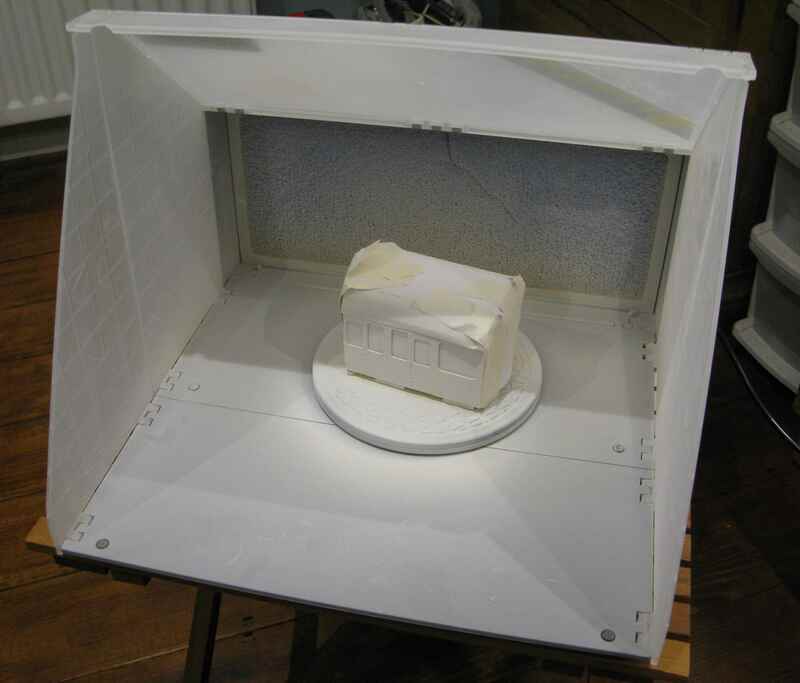 The pictures below show the results of a test run. 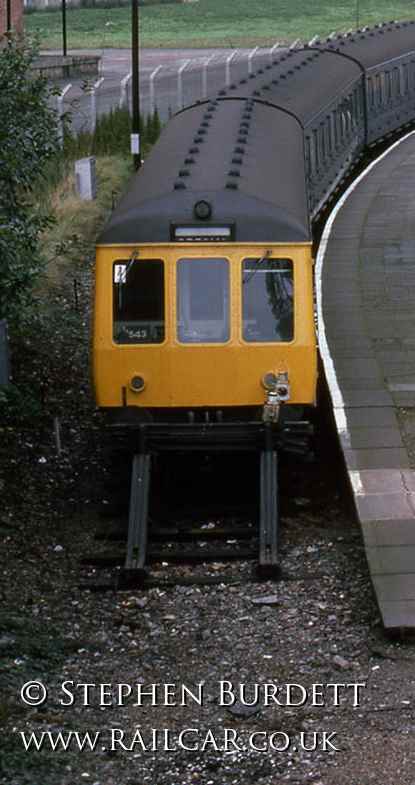 The top of the cab roof was rubbed down, masked and then spray-painted in the same way as the styrene roof. 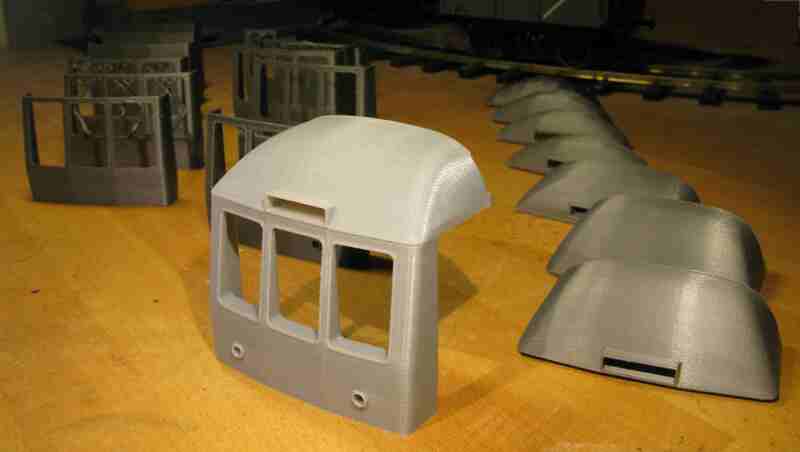 The outside of the cab front was rubbed down, masked and spray-painted in the same way as the body sides except this time using Phoenix Precision Paints P134 BR Signal Yellow (dull) from a spray can for the top-coats. 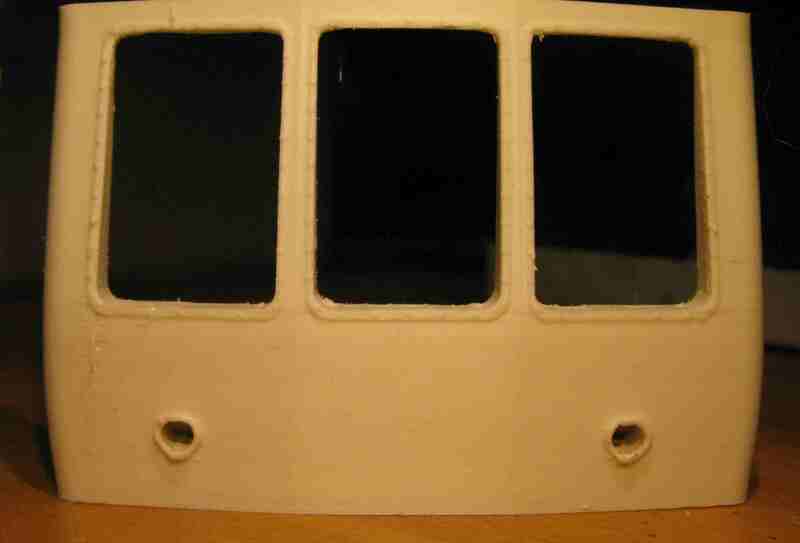 Then the control-panel area inside was painted with a coat of Humbrol 64 enamel matt grey before the controls themselves were picked out in largely gloss colours: black (Humbrol 21), white (Humbrol 22), metallic (Humbrol 56 to pick out parts of the instrument panel and Humbrol 11 for the handles/wheel themselves), red (Humbrol 20) and green (Humbrol 226). 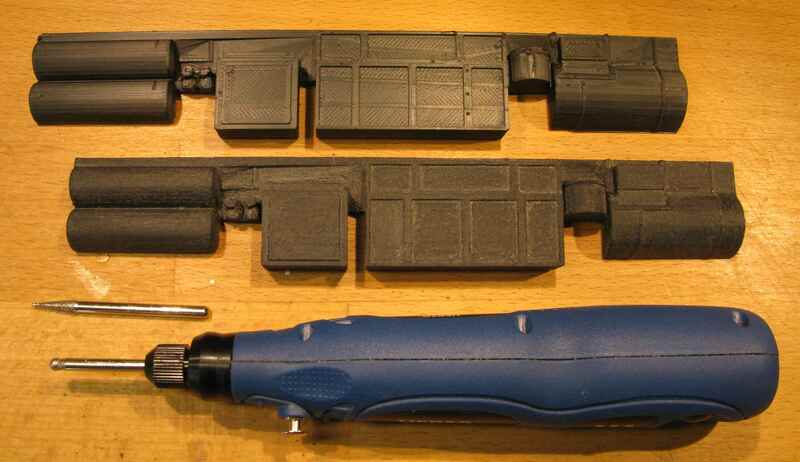 I left painting the chassis sides, drivers' steps and buffer bars until the weathering stage post-assembly. For the partitions, I just painted a coat of gloss dark brown (Humbrol 10) on the raised areas that represent the woodwork. 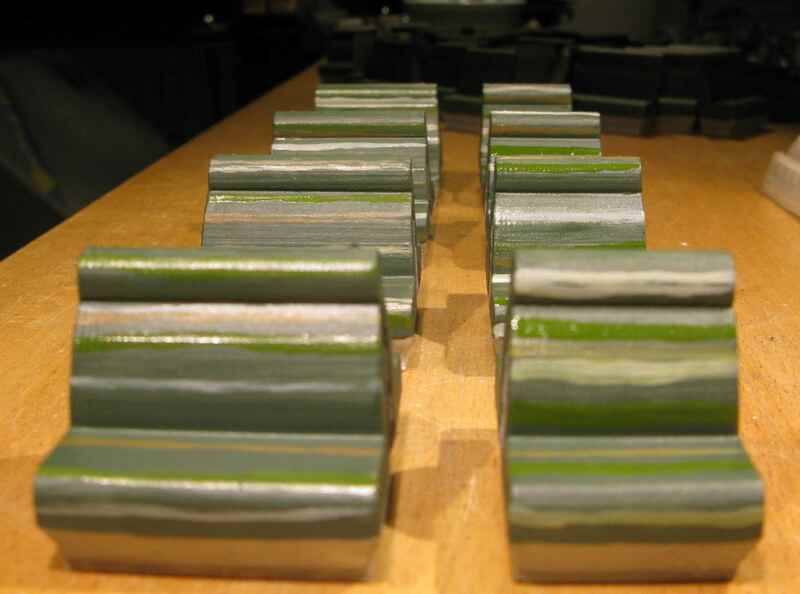 The seats were painted in Humbrol enamels: on all surfaces except the base a coat of matt grey (Humbrol 64) followed by a coat over what would be the upholstered area of matt dark green (Humbrol 226) and, on top of the green, three narrow double stripes of matt light green (Humbrol 90), two or three thicker stripes of matt mid green (Humbrol 30) and two or three narrow stripes of matt brown (Humbrol 110). 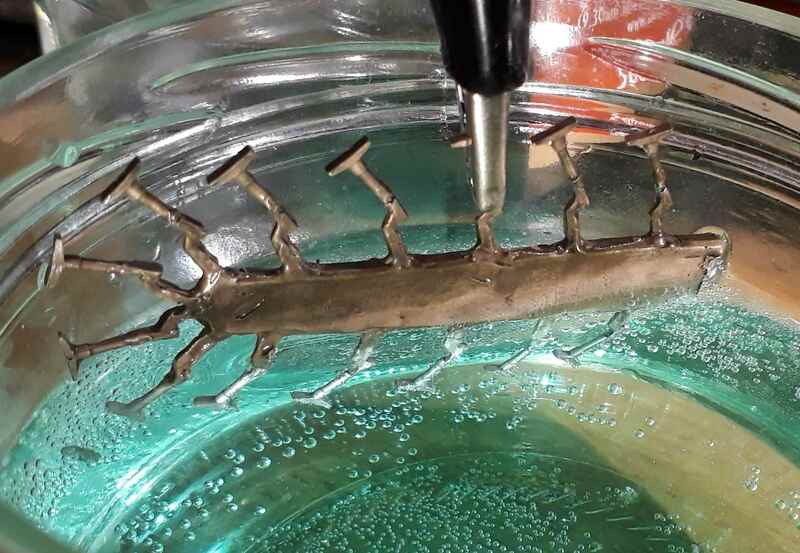 note: don't get the power terminal in the solution or you will end up plating things in copper instead. 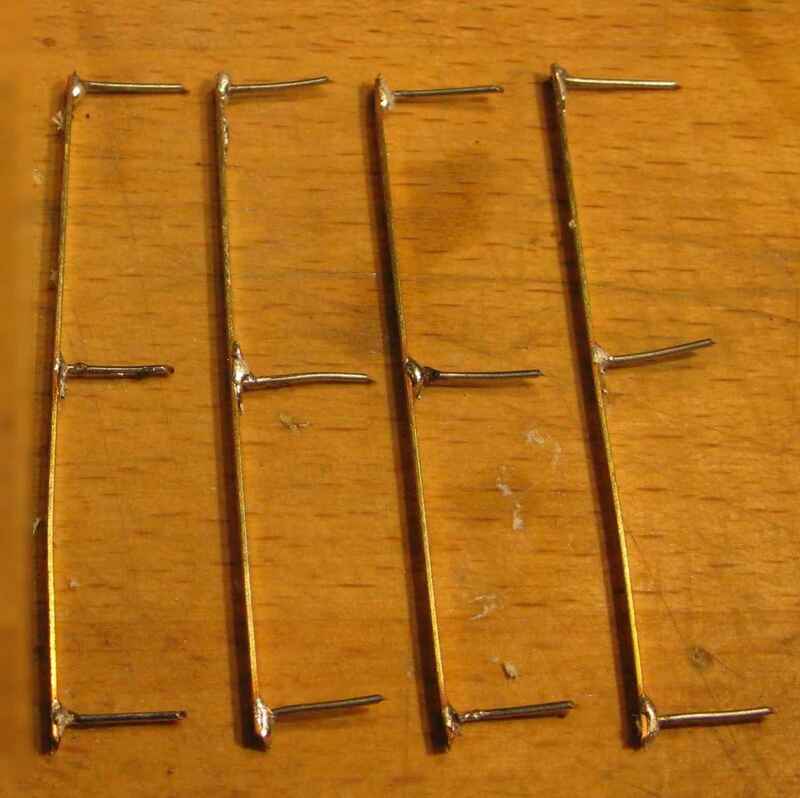 To plate any handles that are not on sprues, use a 1 mm drill to make N holes in a nickel strip, place the handles loosely in these holes and then hang the strip in the solution; that way you'll definitely be coating them in nickel. In the last row of pictures below the plated handles are shown beneath their unplated counterparts and then the test-fitted handles (holes in the body made with a 1 mm drill and a blob of thick cyanoacrylate adhesive applied on the inside of the body to hold the handles in place) are shown beside the real thing; somewhat on the chunky side but they will do. 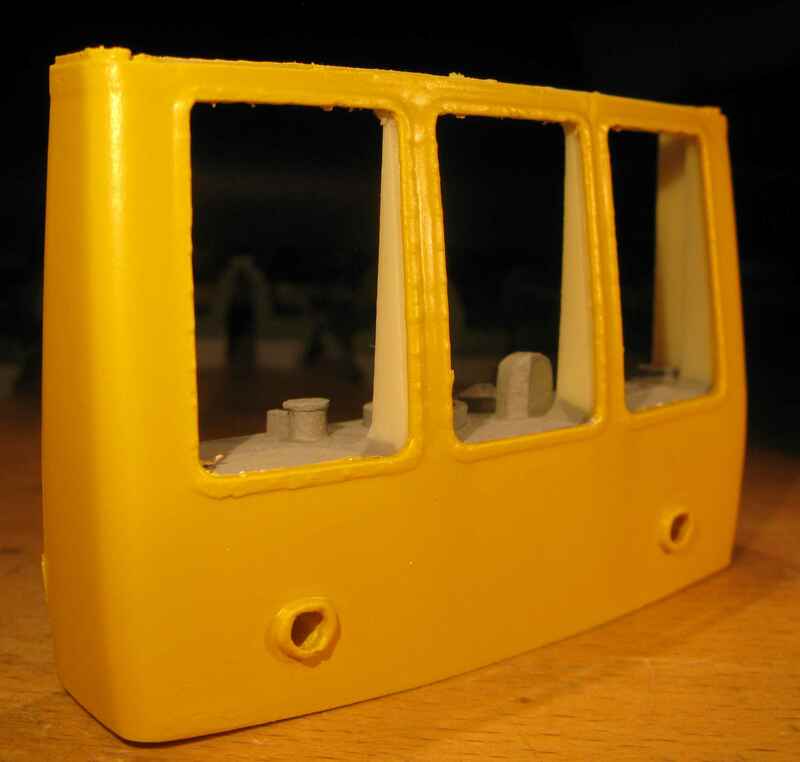 For the long grab-handles fitted beside the driver's door and brake van door (6 are required) I purchased some brass strip, 0.4 mm x 1.6 mm, from 4D Model Shop, cut pieces 47 mm long and soldered 24 SWG (0.55 mm diameter) wire to either end and the middle for anchor points. 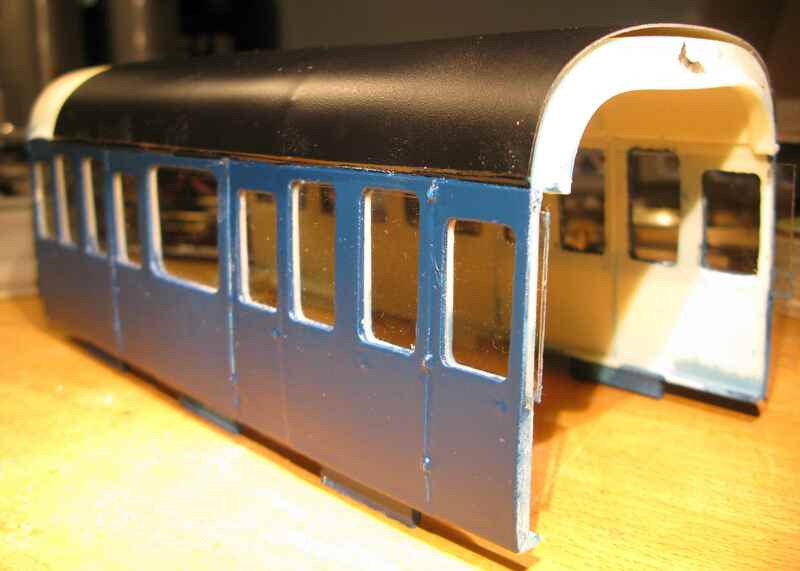 I haven't done so in the test fitting shown below but, from what I could see from the images on railcar.co.uk, these long handles are generally painted the same colour as the body where they are mounted so there was no need for nickel plating, I will just paint them before final fitting. 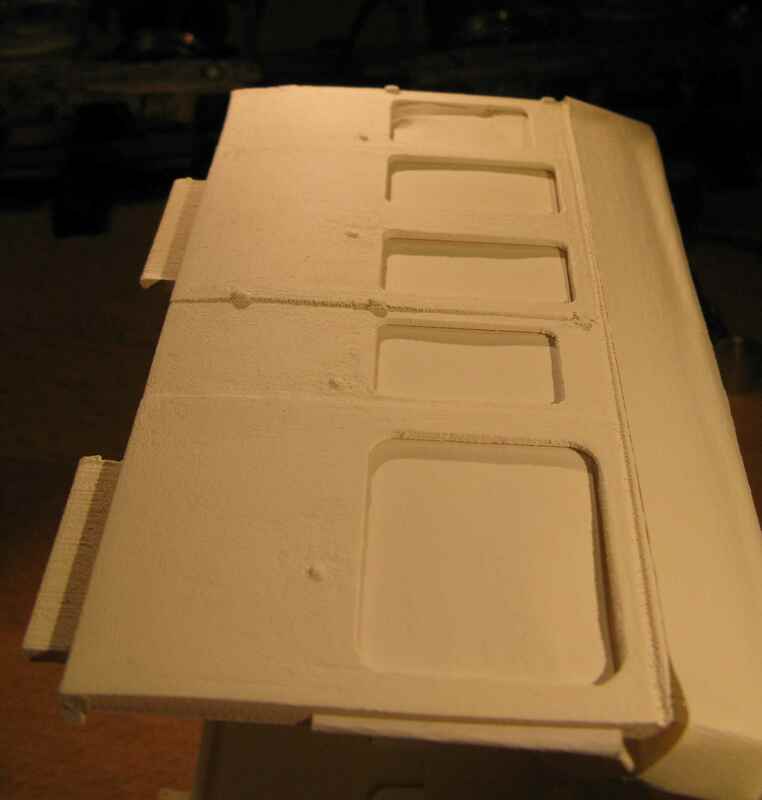 The remaining decorations were the ventilation "shells" along the top of the roof, for which I used Tenmille AG243 (40 off). 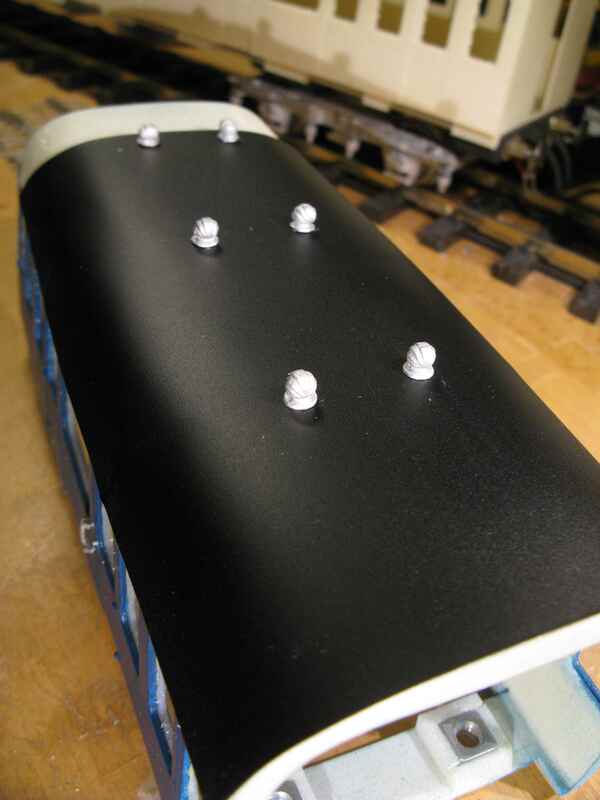 These were attached to the fitted roof cover with a spot of thick cyanoacrylate adhesive through pairs of 3.2 mm holes spaced 55 mm apart and 12 mm either side of the centre of the roof. 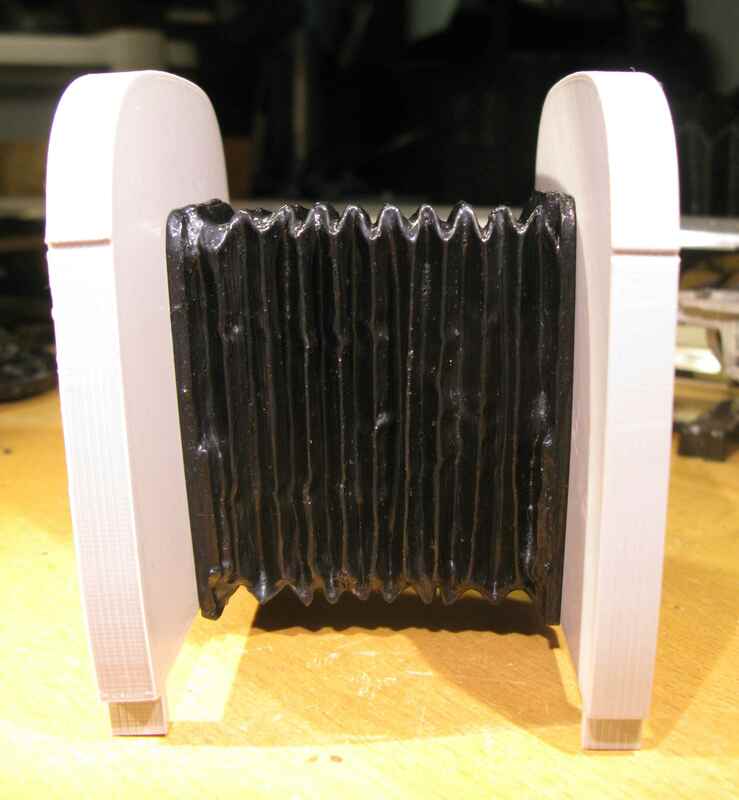 A test fitting is shown below beside the real thing; the shells will be painted matt black before they are fitted for real. people: I ordered some painted seated figures from Hong Kong but the smallest man was 6' 4" tall and all the figures had their elbows sticking out so I had great difficulty fitting them sensibly through the doors or onto the seats.